Get ready for lots of rain Thursday as Michael bears down on the Carolinas. 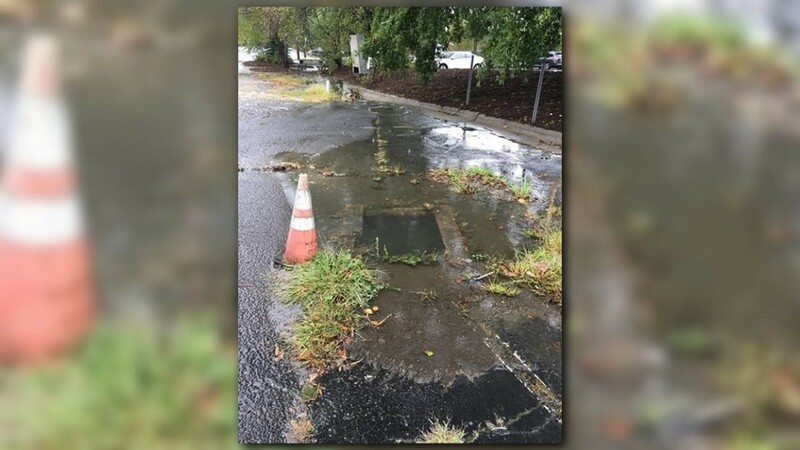 GREENSBORO (WFMY) - The Carolinas are far from the clear of Tropical Storm Michael. 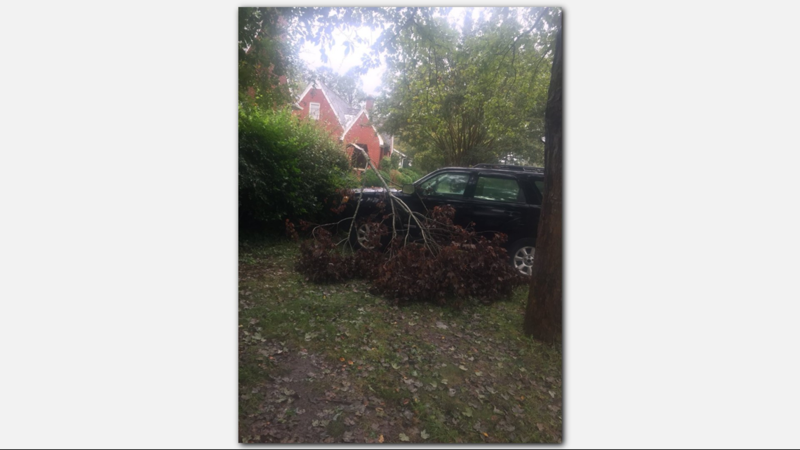 We started feeling effects from the storm Thursday morning. 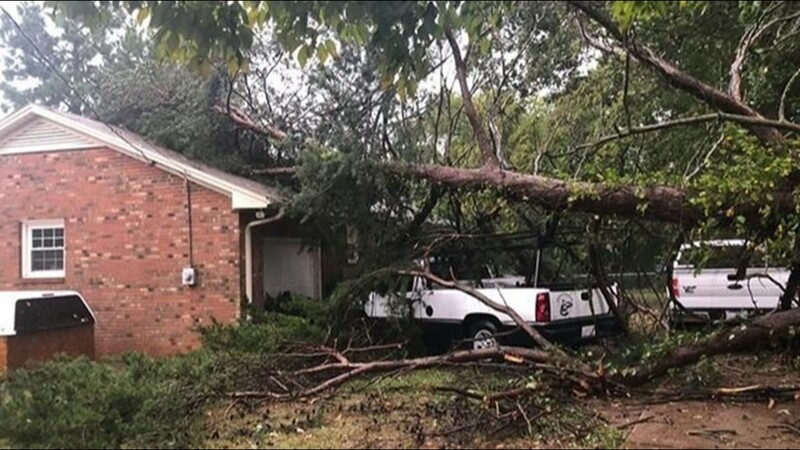 If you have photos or video to share on social media, be sure to use the #StormTrack2 hashtag. 11:06 p.m. 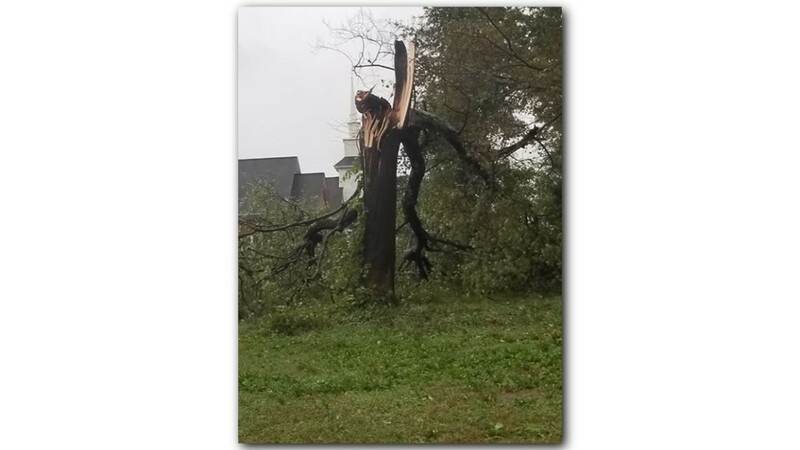 The Town of Elon Municipal building was damaged due to falling limbs from a large tree from Michael, because of this, it will delay the opening of the administrative offices. 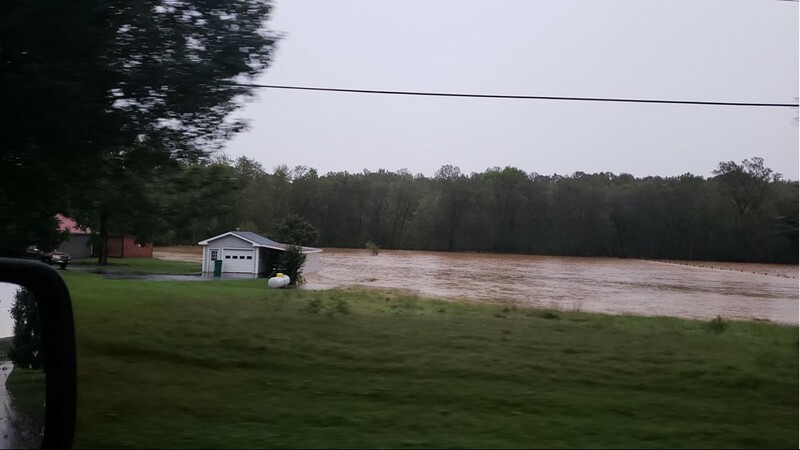 10: 45 p.m. Haw River expected to continue to flood into tomorrow before receding back to normal water levels. 10:00 p.m. LIVE UPDATE: Michael leaves behind a mess. 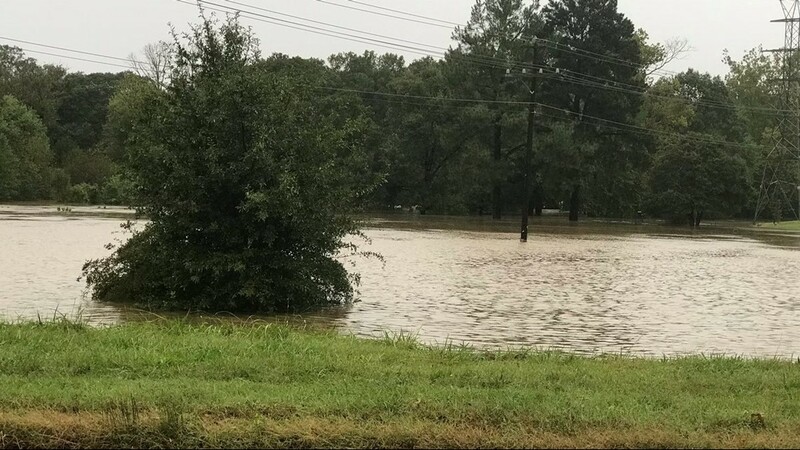 Roads flooded, power lines down, and thousands in the dark across the Triad tonight. 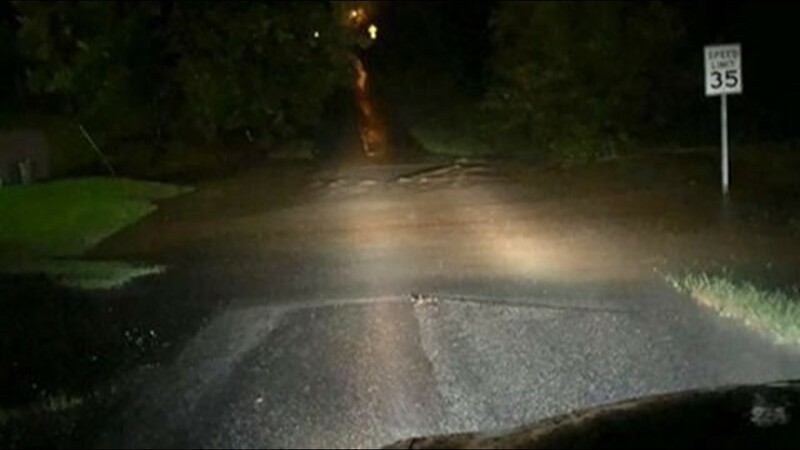 9:51 p.m. Footage from a water rescue in Danville, VA due to Michael. 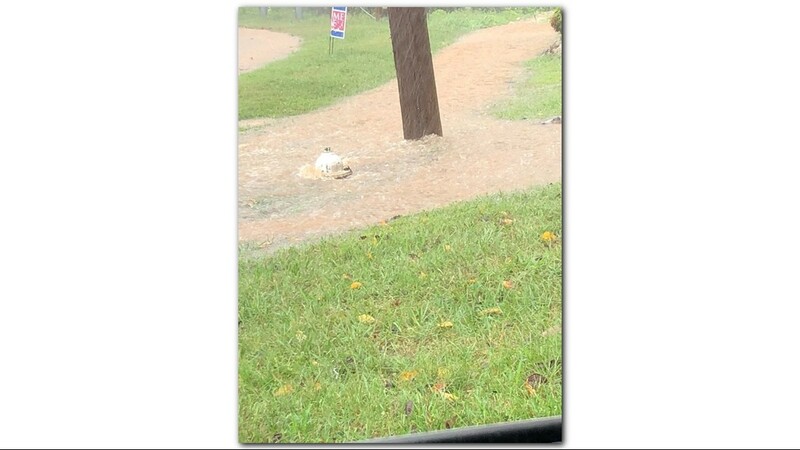 The rescue happened on Riverside Drive. 8: 46 p.m. A cold front that combined with Michael is what caused high wind speeds today. 8:29 p.m. Duke Energy customer service lines are currently down, experiencing problems with their phone system. Duke Energy says its customer service lines are down and it's having a problem with their phone system. A rep says it's working hard to get the problems fixed. Customers are asked to go to https://t.co/bcvSWySTYY in the meantime. 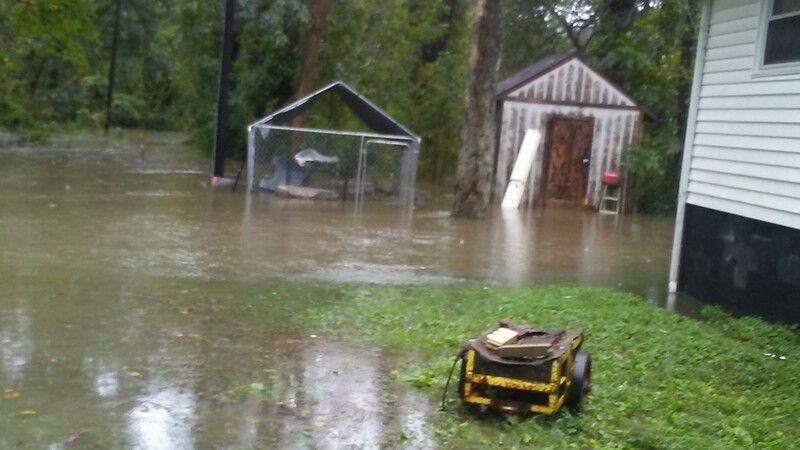 8:25 p.m. Video of a someone's dock floating in Buffalo Lake, New Irving Park in Greensboro. 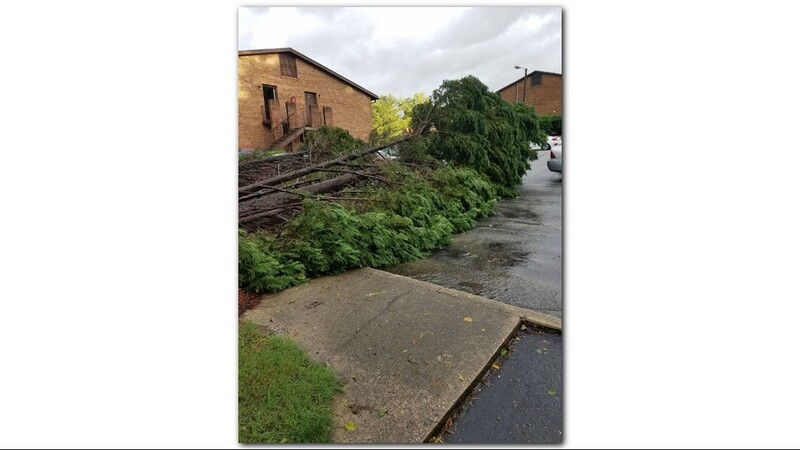 8:01 p.m. Tree damage at Grimsley High School in Greensboro. All Guilford County Schools are closed Friday, October 12th. 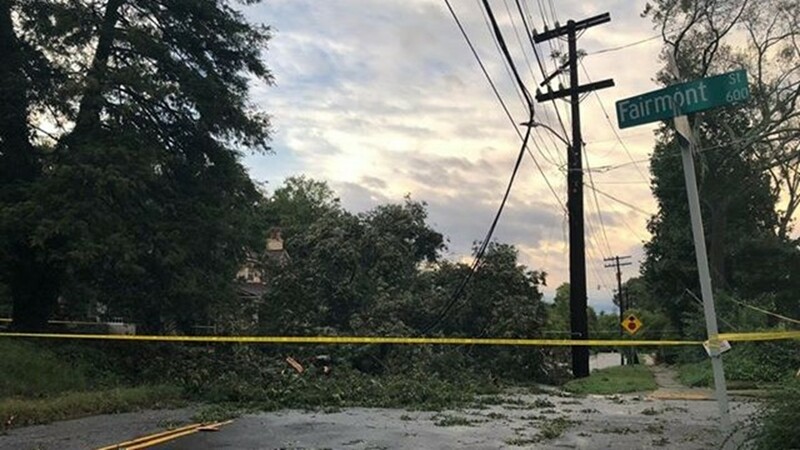 7:55 p.m. VIDEO: Powerline explodes in Greensboro at Latham Park. 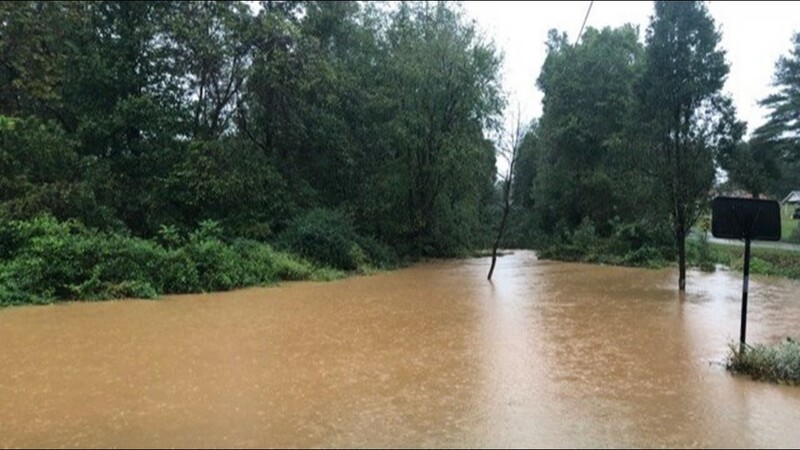 7:42 p.m. North Buffalo Creek in Greensboro hit record levels this afternoon for flooding. 7:00 p.m. 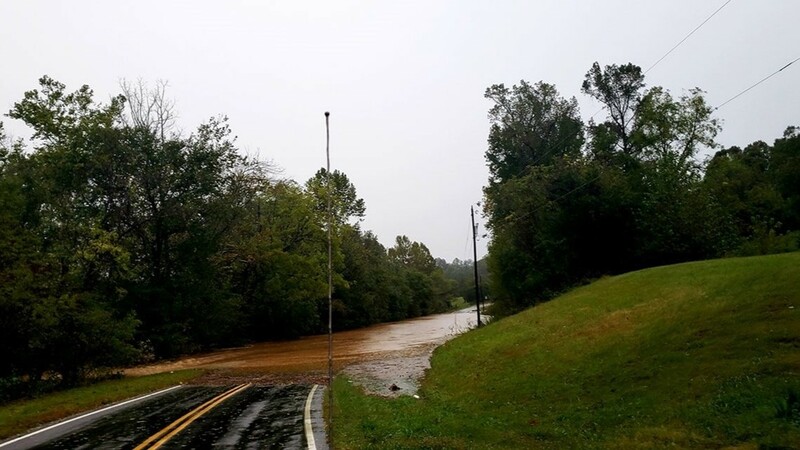 The City of Greensboro reports a portion of Horse Pen Creek Road is closed, between Jessup Grove Road and Drawbridge Parkway. 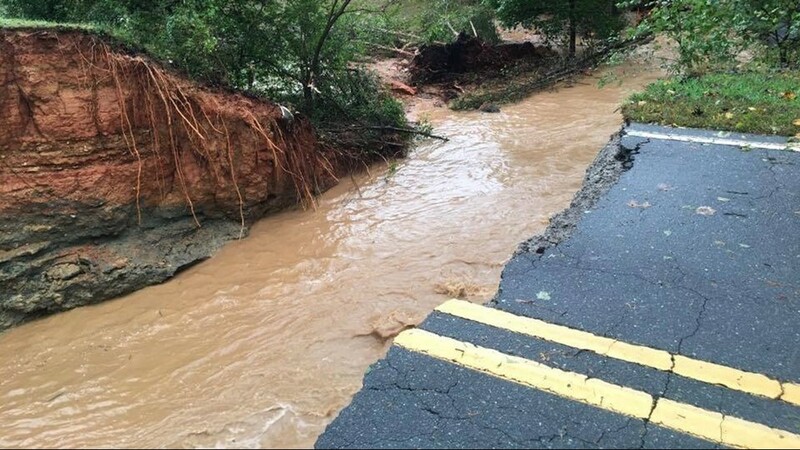 The section of road was washed out during Michael. 6:26 p.m. Family Fare is currently the only working gas station in Reidsville, long lines are expected. 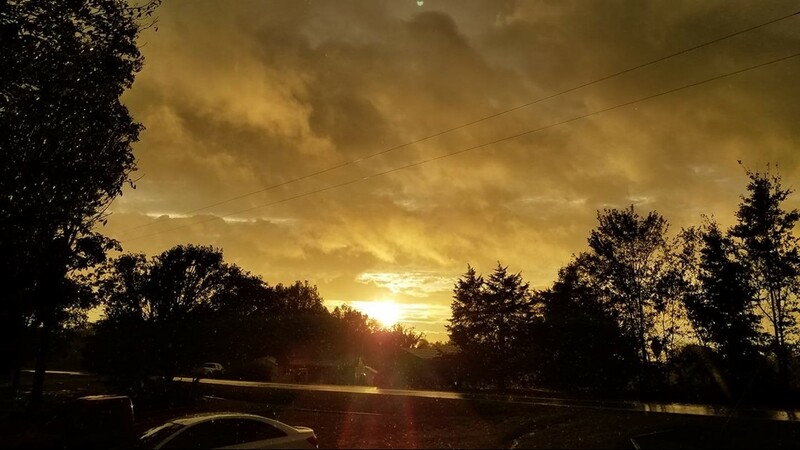 6:05 p.m. Sun spotted out in Greensboro as Michael begins to move it's way out. 5:57 p.m. Blue skies spotted behind storm clouds on Battleground Avenue. 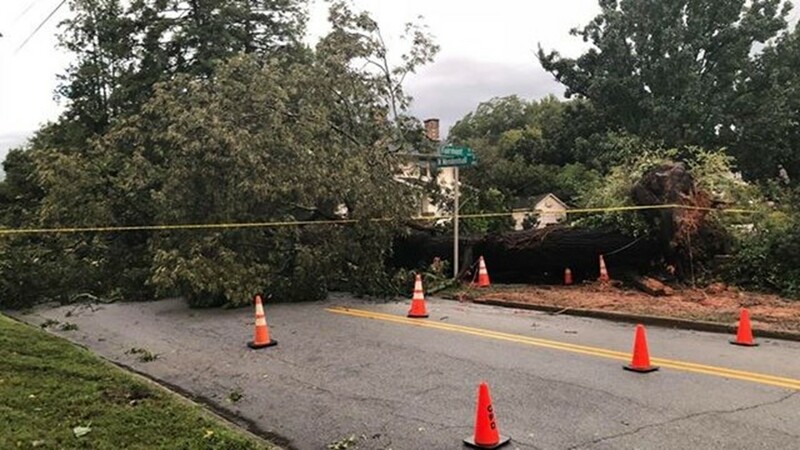 5:21 p.m. Wendover Avenue westbound in Greensboro currently blocked by fallen tree. Traffic is being re-routed. 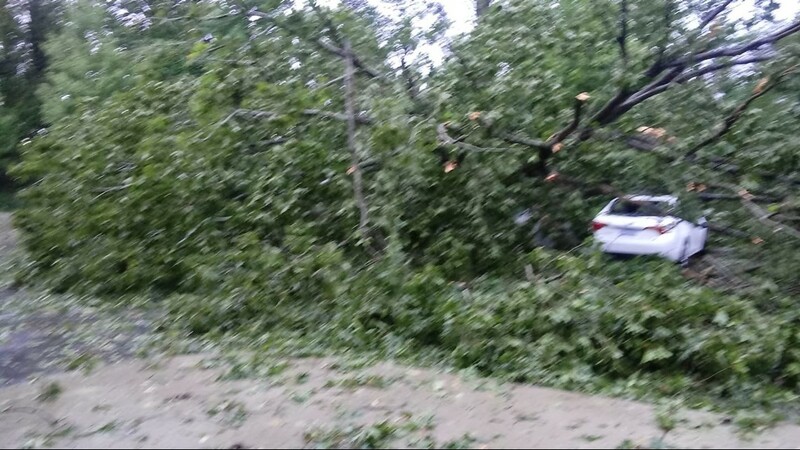 Wendover Ave. in Greensboro blocked in by a tree. Photo from James Moffat on Twitter. 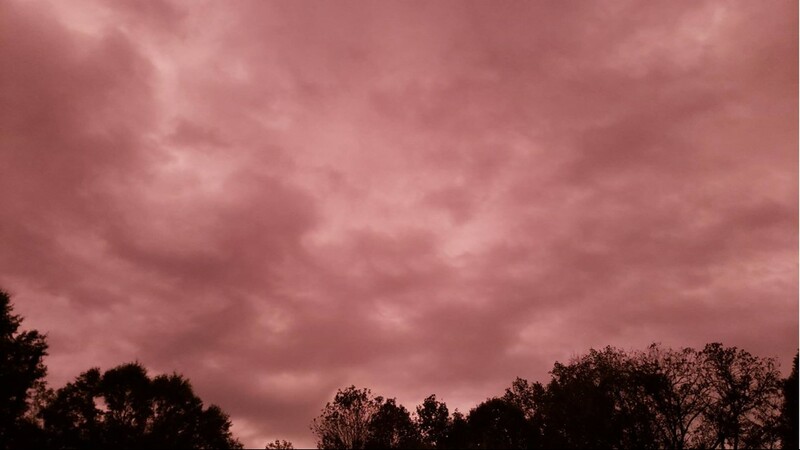 5:06 p.m. Governor Roy Cooper live addressing the threat of Michael. 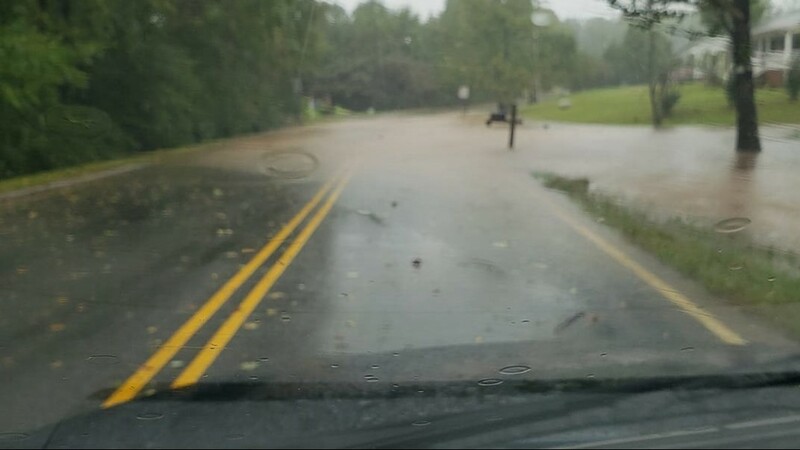 4:47 p.m. Buffalo Creek in Greensboro currently experiencing major flooding. 4:34 p.m. 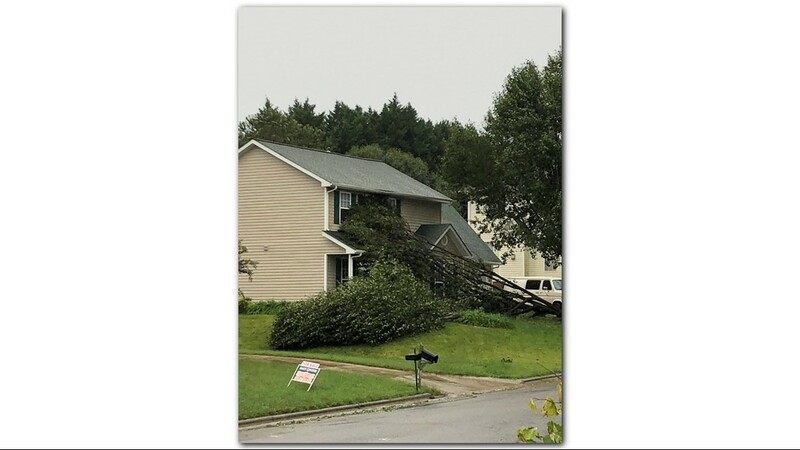 Still not confirmed but there were reports of a possible tornado touching down in Rockingham County. 4: 17 p.m. 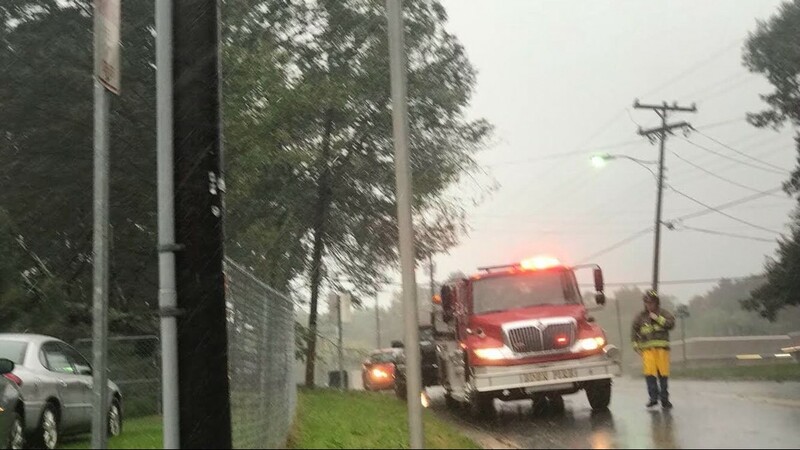 According to Guilford County EMS Wendover Ave. East is blocked at Walker due to live powerlines caused by the heavy winds and rain from Michael. 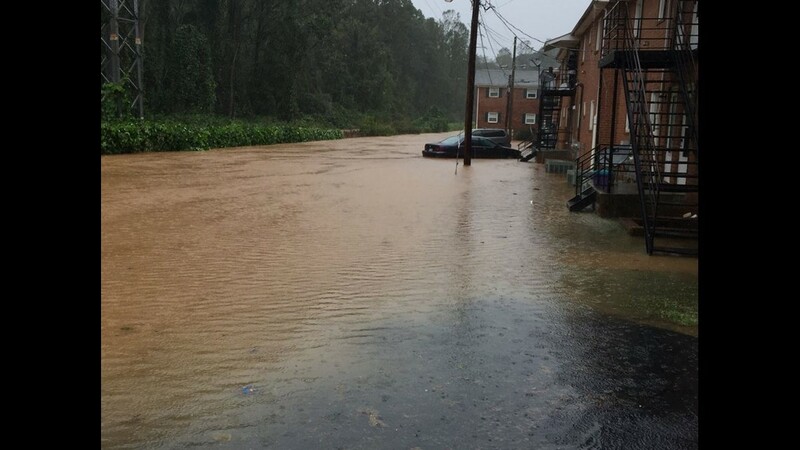 4:16 p.m. Occupants have been evacuated from the Ladera Crest Apartments in Winston-Salem due to rising flood waters. 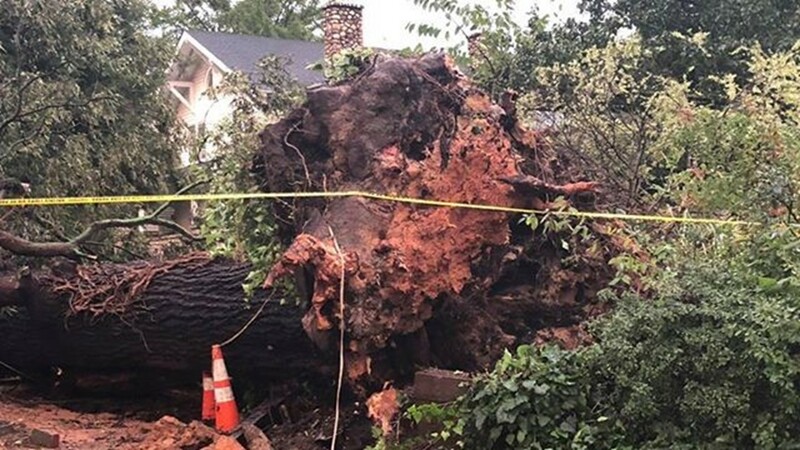 4: 10 p.m. Two big oak trees have come down across Haggard Avenue near Martin Alumni center in Alamance County on the campus of Elon University. 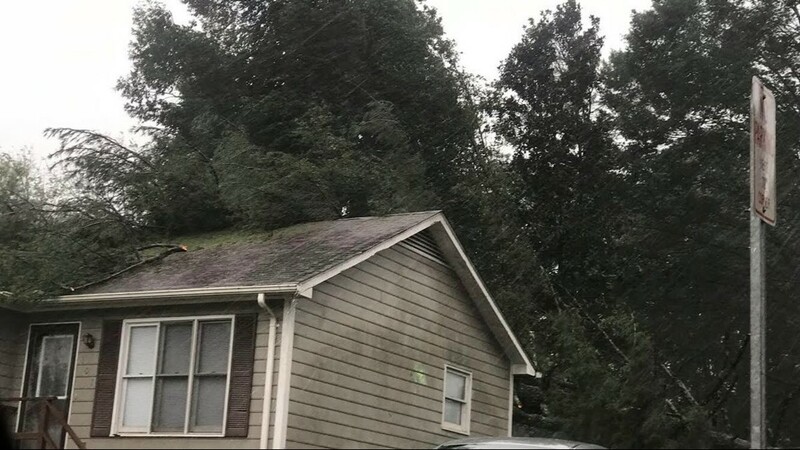 4: 03 p.m. Tree falls on house deck on Pisgah Church Rd. in Greensboro. 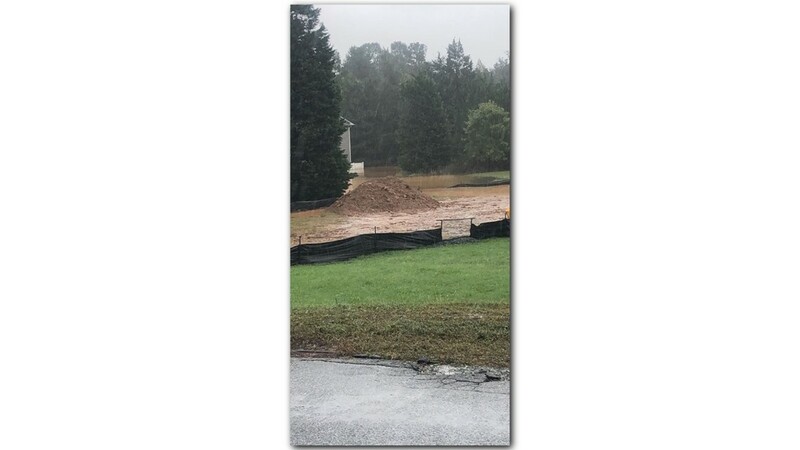 3:50 p.m. Video from Creekside Terrace apartments in Winston-Salem where Little Creek runs through. 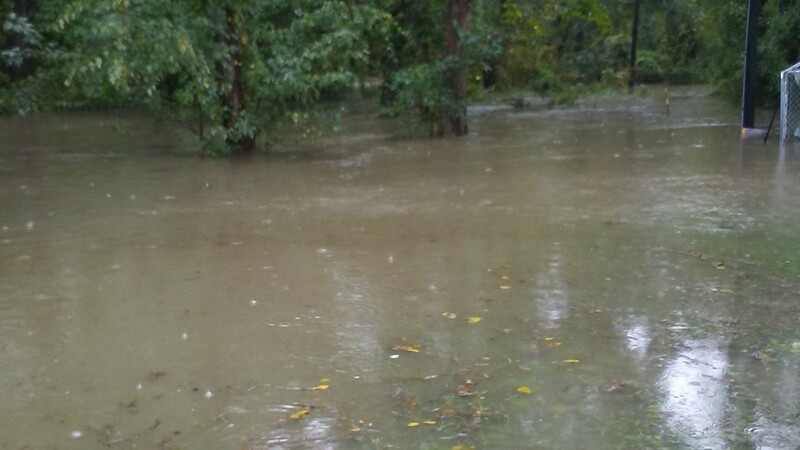 Those who live in the complex say that it's common for the creek levels to rise during heavy rains. 3:34 p.m. 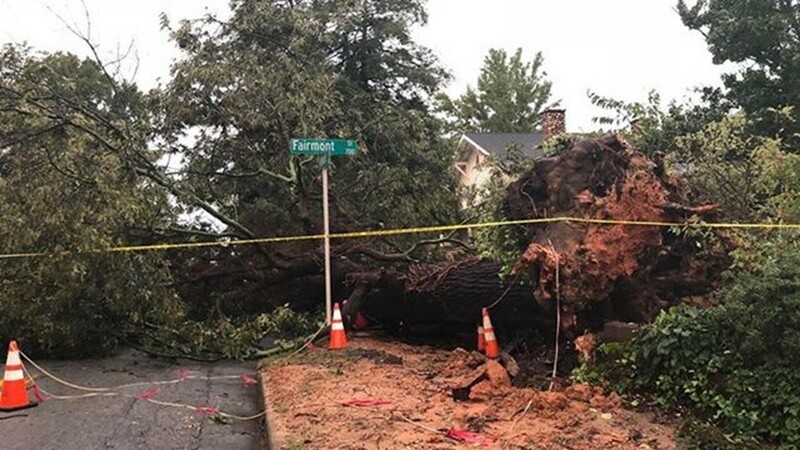 Governor Roy Cooper has issued a State of Emergency for Guilford County as Michael blows through the Triad. 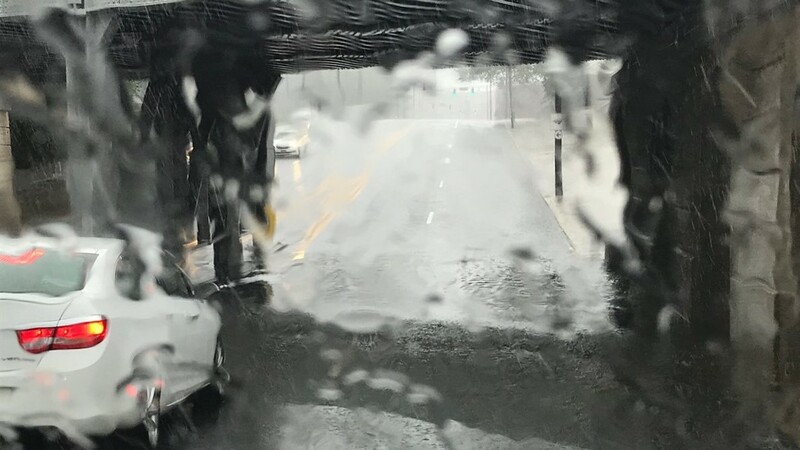 3:30 p.m. Meteorologist Tim Buckley urging that you stay home and off the roads until about 6:00 p.m. - 7:00 p.m. tonight when conditions are expected to be better. 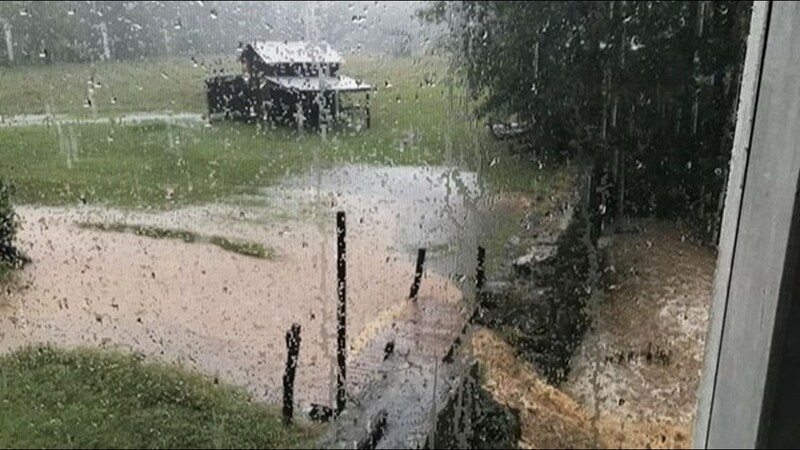 3:30 PM -- The weather is AWFUL in the Piedmont. Widespread wind gusts over 50+ mph are likely. No tornado warnings, but significant severe wind moving through with the last of Tropical Storm Michael. 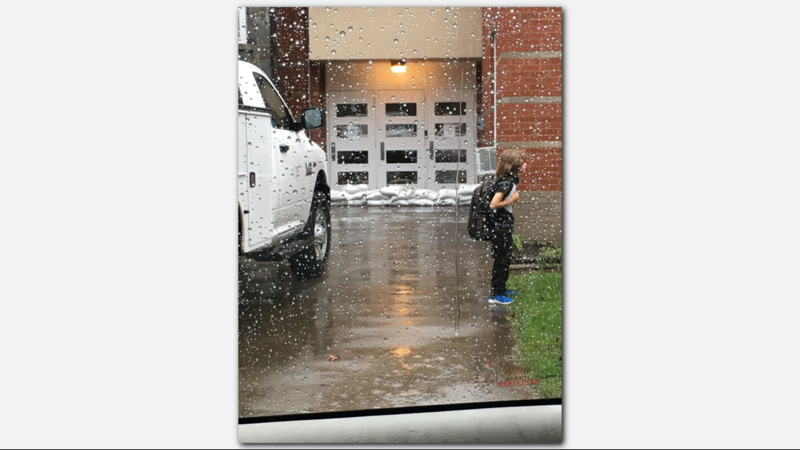 STAY HOME and STAY SAFE until about 6pm-7pm. 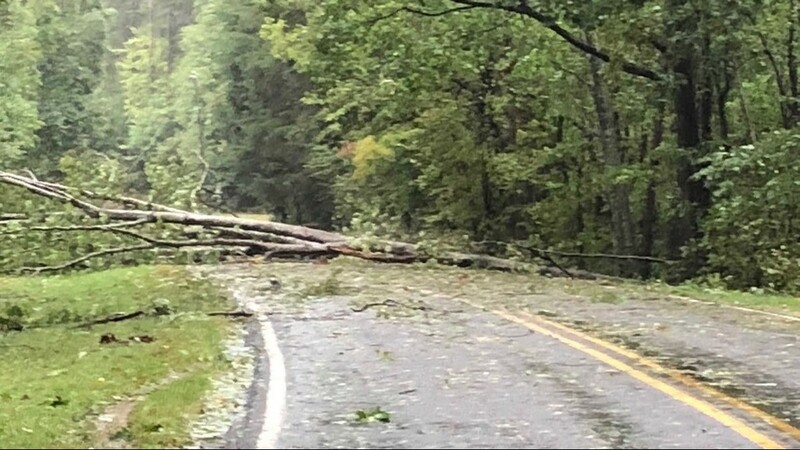 3: 25 p.m. Iredell County Fire Marshall David Souther confirmed to our WFMY staff that a death occurred when a tree fell on a car on Highway 64 East of Statesville. 3:11 p.m. A look at part of Cone Blvd. 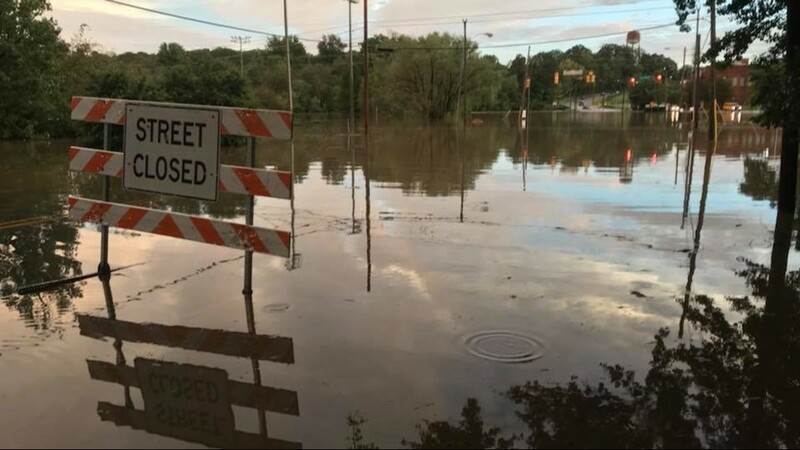 currently closed off due to flooding in Greensboro. 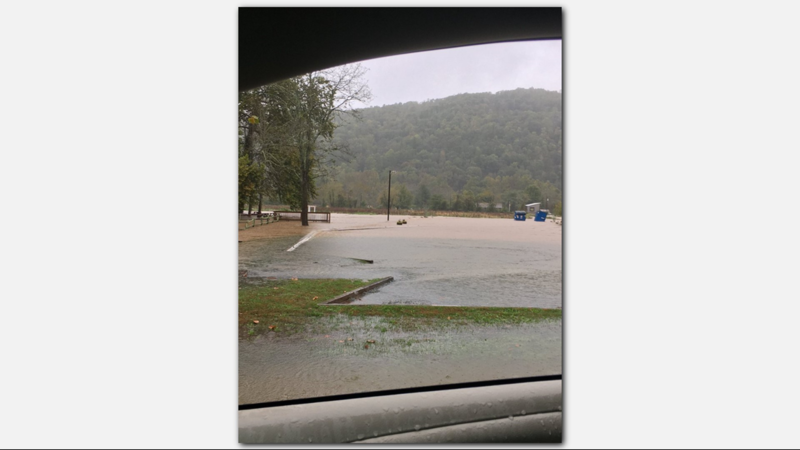 3:00 p.m. Riverside Park in Mount Airy is currently flooded due to the heavy rain from Michael. 2:57 p.m. 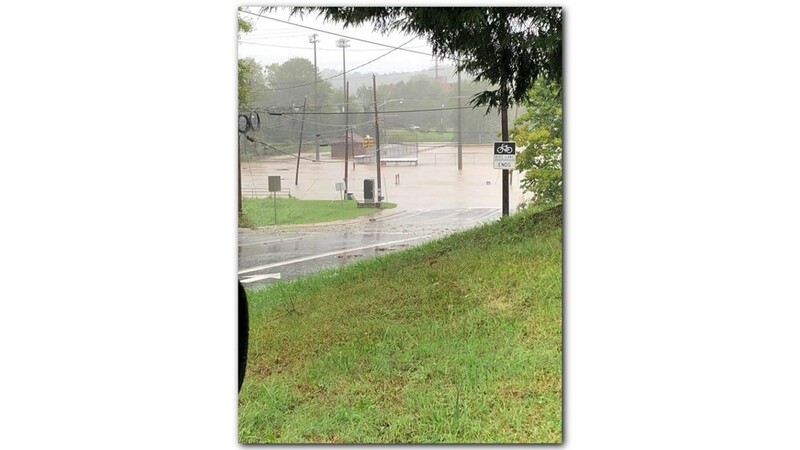 Baseball field underwater on Yanceyville St. by Revolution Mill in Greensboro. 2:55 p.m. 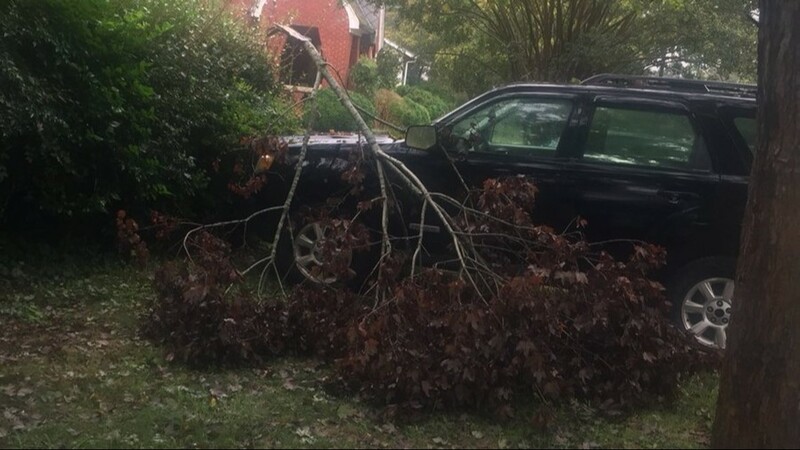 Car hit by a downed tree while taking a ramp off Marshall Street in Winston-Salem. 2:47 p.m. 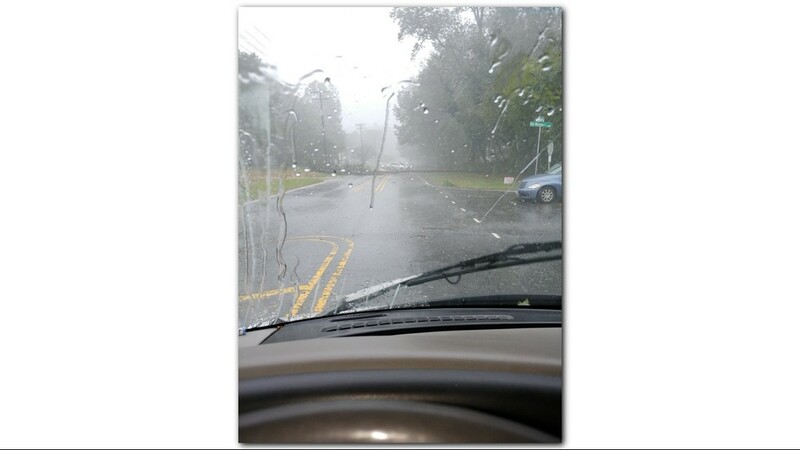 Rain and wind picking up in Greensboro off of Lawndale Road. 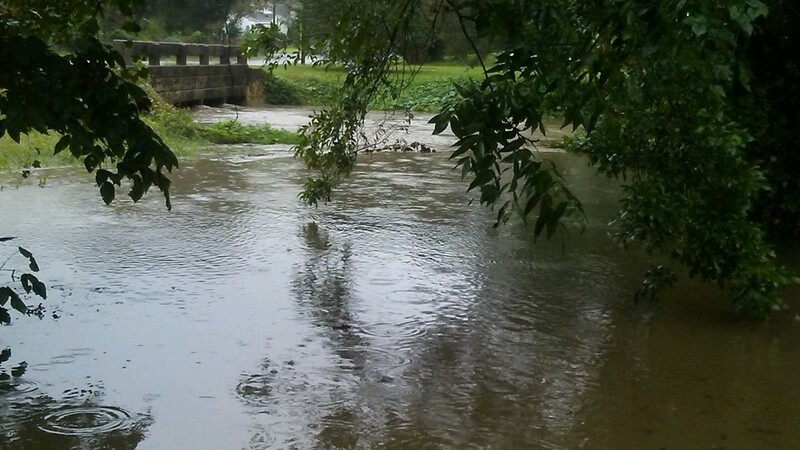 2:25 p.m. Buffalo Creek is now rising at Revolution Mill. A lot of the shops are closed due to the flooding threat. 2:23 p.m. 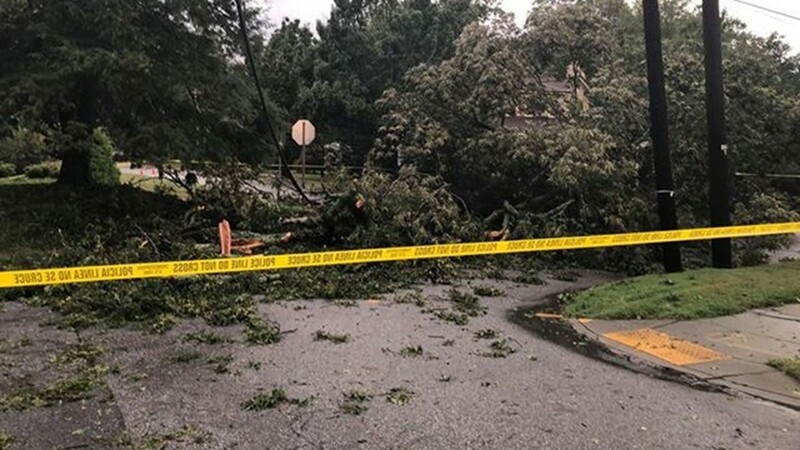 Almost up to 5,000 power outages reported in Forsyth County. 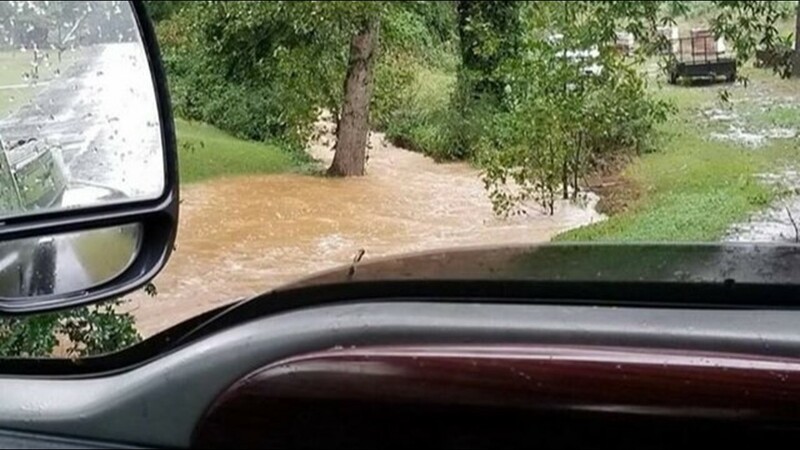 2:11 p.m. Jessica Winters gives a quick update on the conditions in Davidson County. 2:05 p.m. 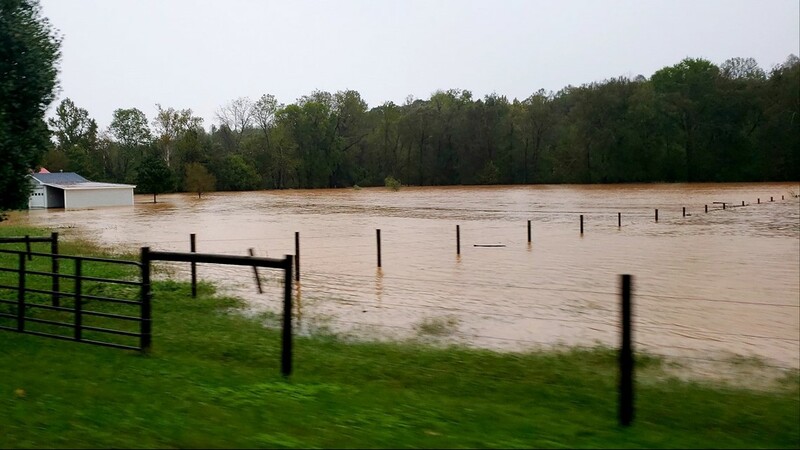 Here is what it looks like currently in Alamance County. 2:02 p.m. Duke Energy is currently working on a downed power line in Tyro. 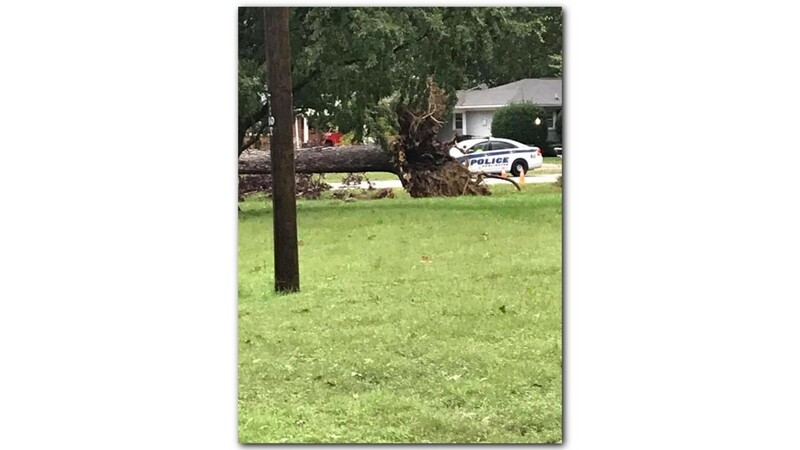 It is said to have caused some power outages in the area. 1:45 p.m. The heaviest rain so far today has been reported North of 1-40. 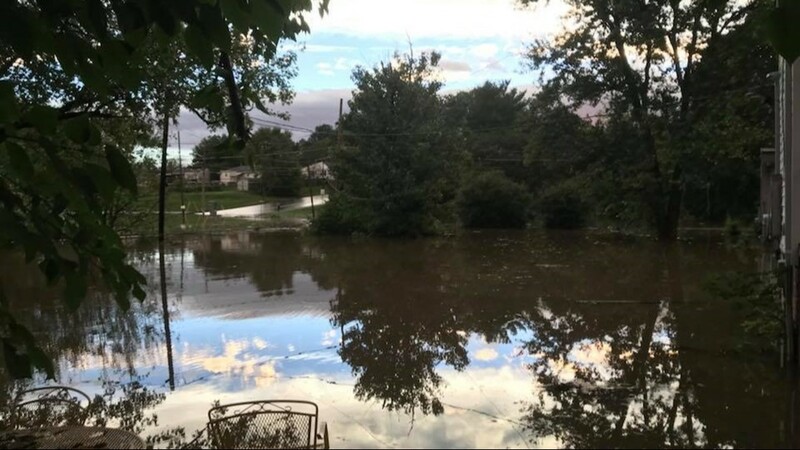 We have about 5 hours of rain left. 1:41 p.m. 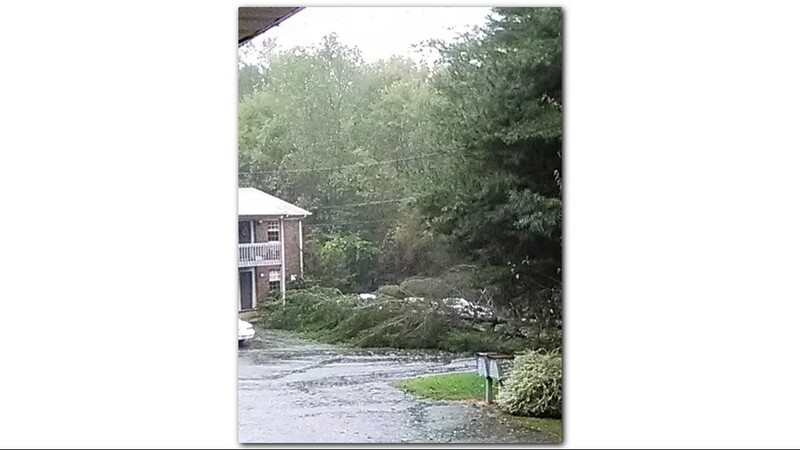 Rain and winds picking up in Lexington causing small trees to fall. 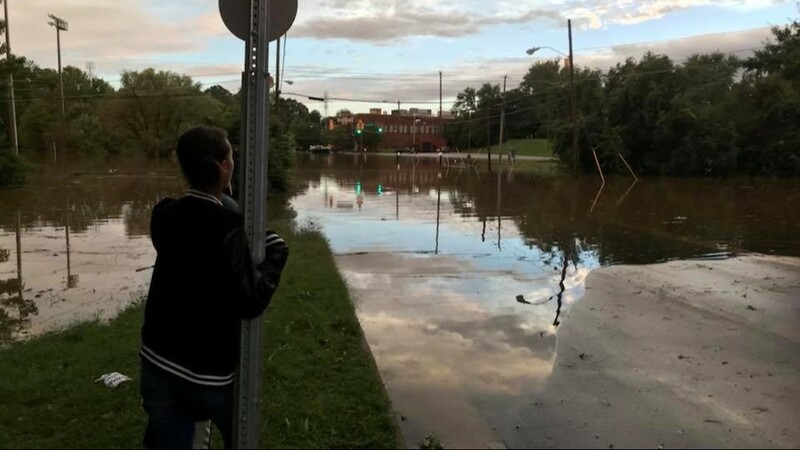 1: 37 p.m. Reports of flooding at Summit Ave. at Lindsay St. bridge in Greensboro. 1:29 p.m. Thousands have already lost power in the Triad. 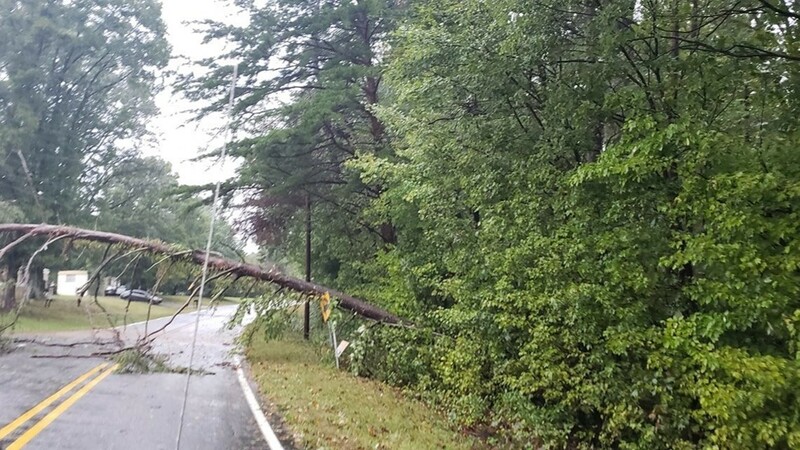 The counties with the most outages so far are Forsyth and Davidson. 1:22 p.m. - Most of the Triad area all the way to the Triangle is covered in Flash Flood Warnings. 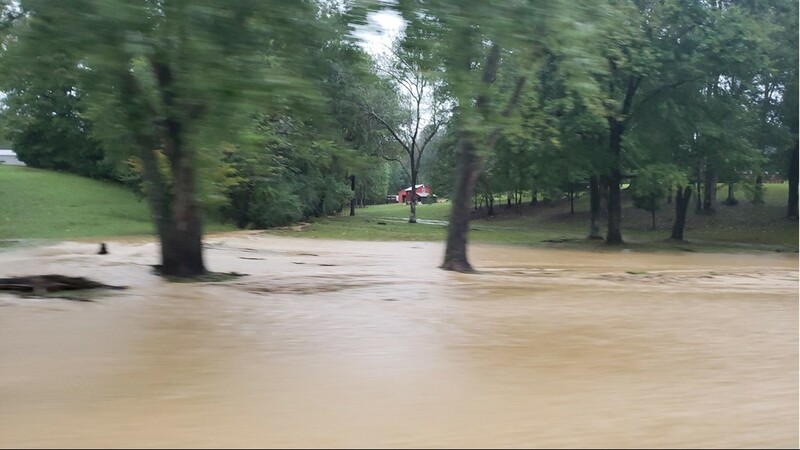 1:14 p.m. - A look at Latham Park in Greensboro. 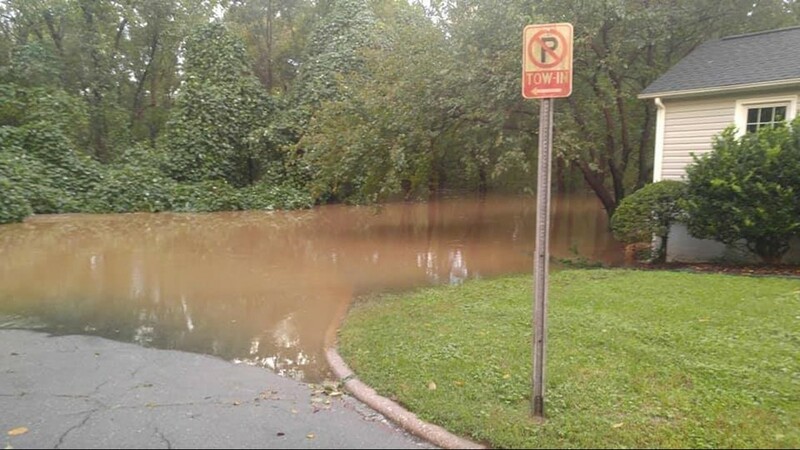 Latham Park is known for flooding when heavy rains occur. Thursday: Michael looks to hang around until the early evening hours. A Tropical Storm Warning is still in effect for much of the state. 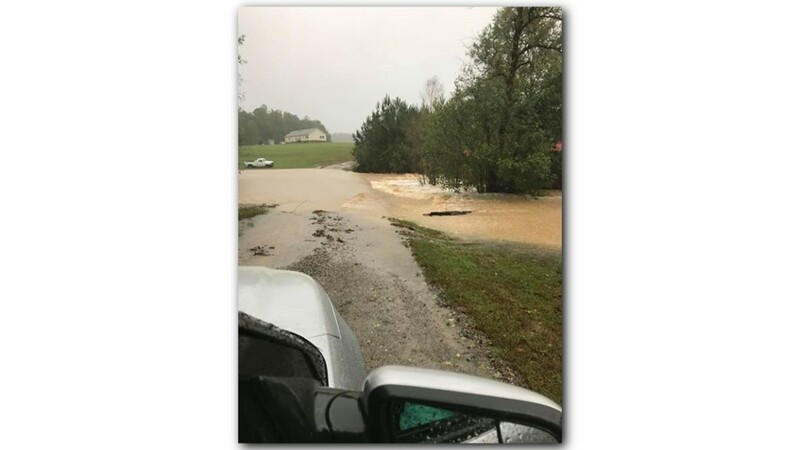 Here's a look at Clyde King Road in Seagrove. 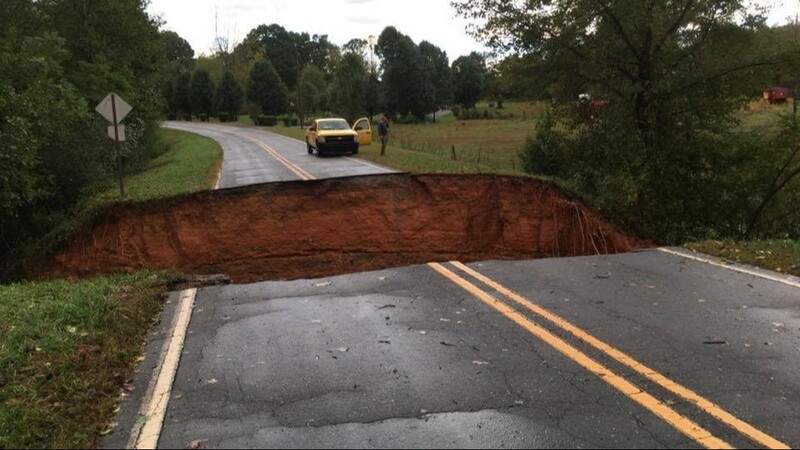 A part of the road was washed away when Florence hit last month. We’ve got about 6 hours left with #Michael. Rain will continue through early evening, and winds will peak with gusts up to 50 mph possible. This will be when the cold front moves through and sweeps #Michael out. Winds are picking up throughout the state. Michael is still moving northeast at 23 MPH. 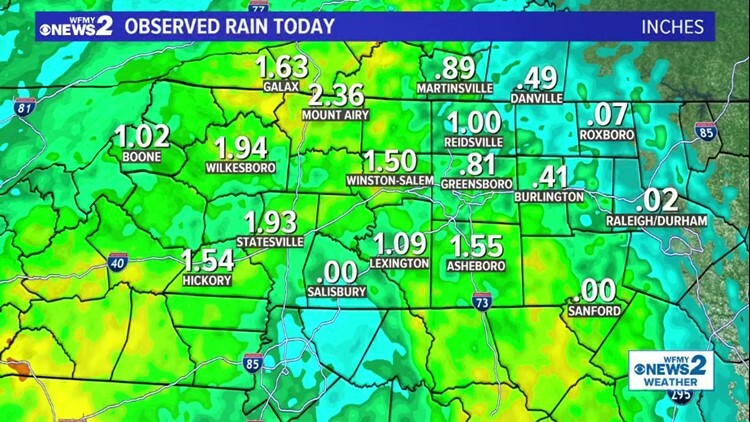 Here are observed rain totals as of 12:45 p.m. Wilkesboro and Mount Airy have had the biggest totals in our area to this point. 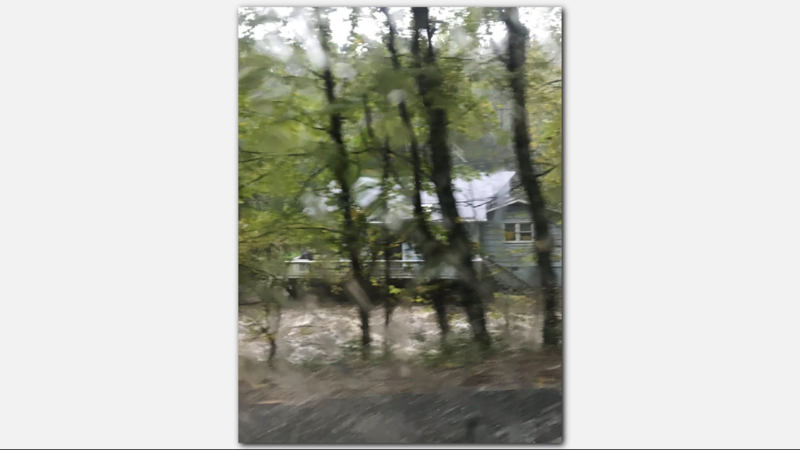 Winston-Salem recording 1.5 inches. 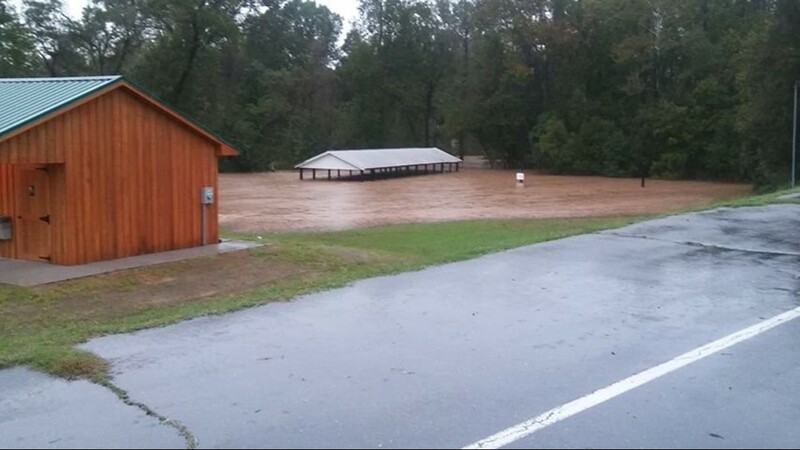 Asheboro at 1.55 inches. 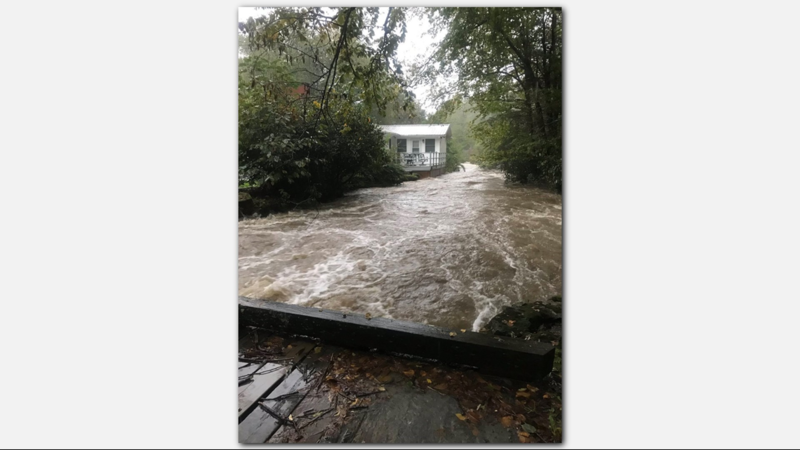 Observed rain from Michael as of 12:45 p.m.
NC Emergency Management reports total power outages are right under 17,000. Around 12:30 p.m., Duke Energy's power outage map showed over 2,400 outages in Davidson County. 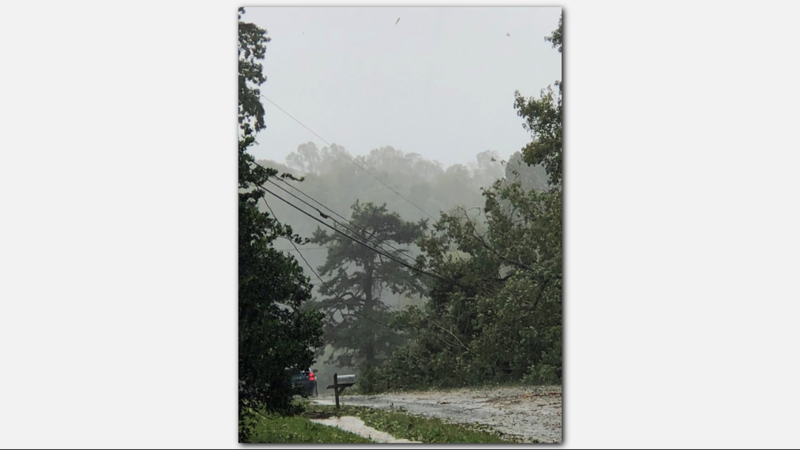 Iredell County (2,607), Alexander County (2,016), Moore County (1,670) and Cumberland County (1,099) also had significant outages. 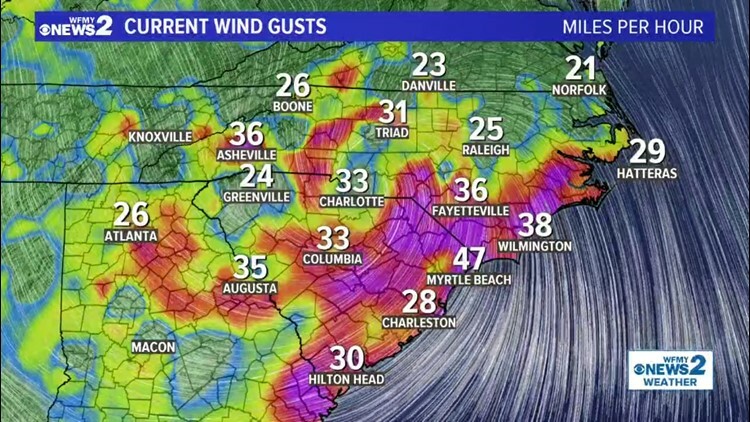 Here's the wind gusts we're seeing in the area. 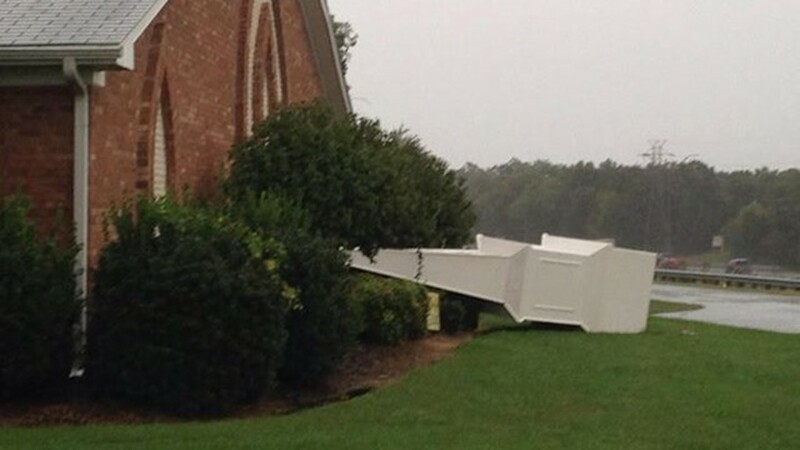 Highest winds look to be in Statesville. Heavy rain is beginning to move into the southern Piedmont heading north. 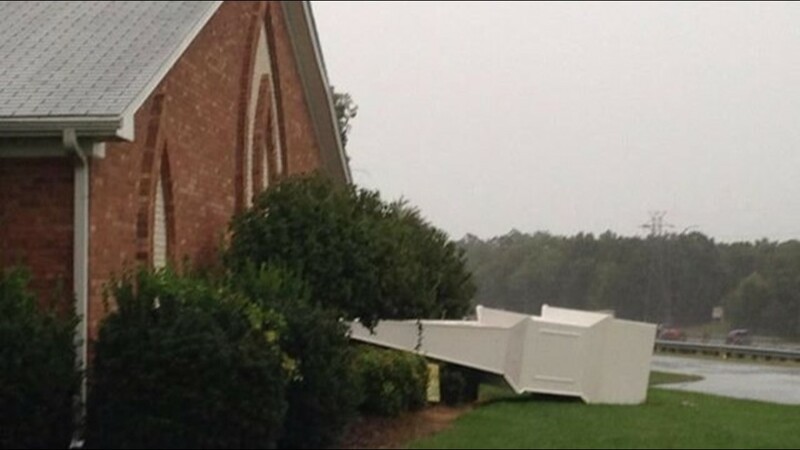 It'll arrive in the metro Triad area around noon. 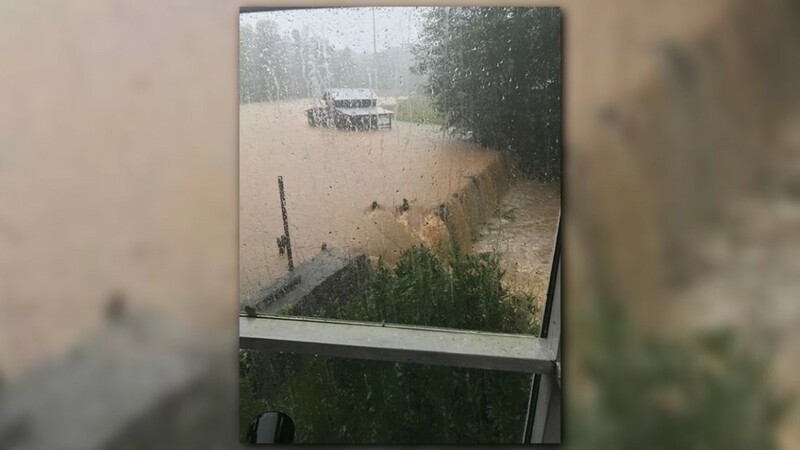 Here's a look at some of the flooding that's impacting North Carolina. 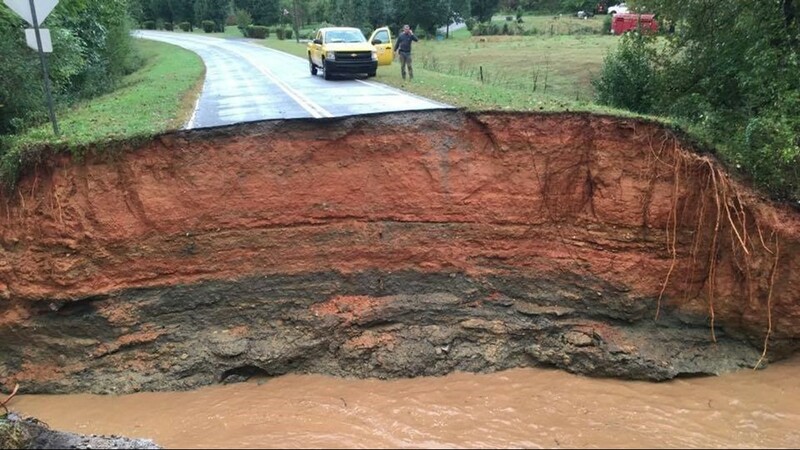 Sinkhole swallows up a section of Hamlet Road in Reidsville. 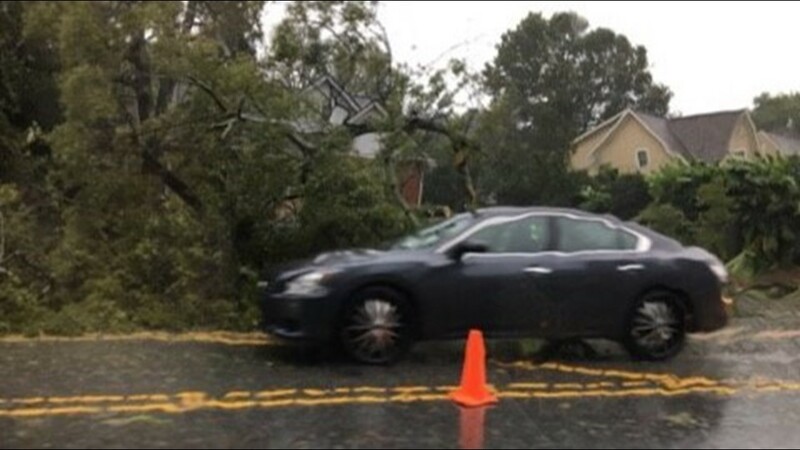 Tree falls across cars on Yanceyville Street in Greensboro. 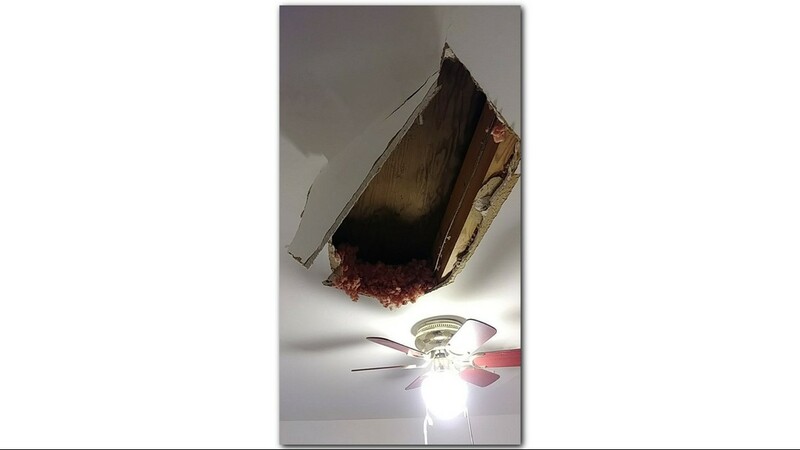 Water damage at Monique Tinsley's home. Bible Baptist Church in Burlington. Photo from Greg Morgan. 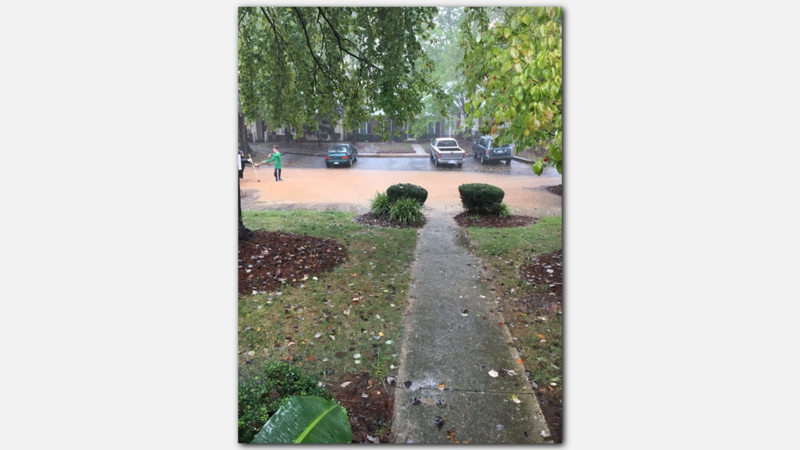 Flooding at Textile Drive and Autumn Drive in Greensboro. 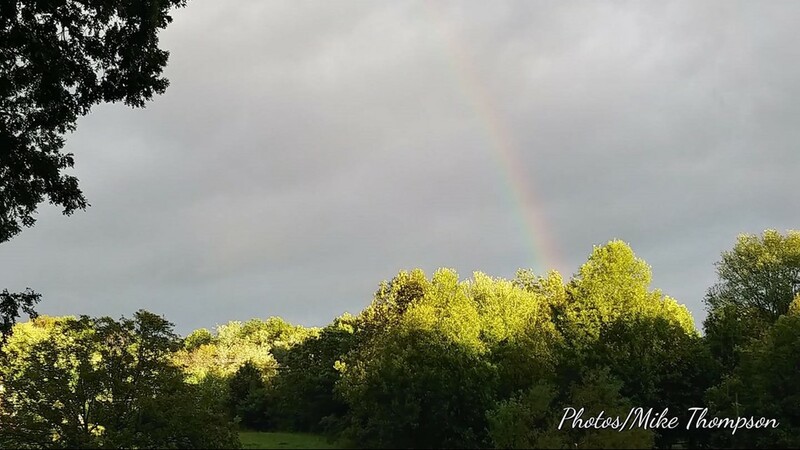 Photo from Laquita Smith. 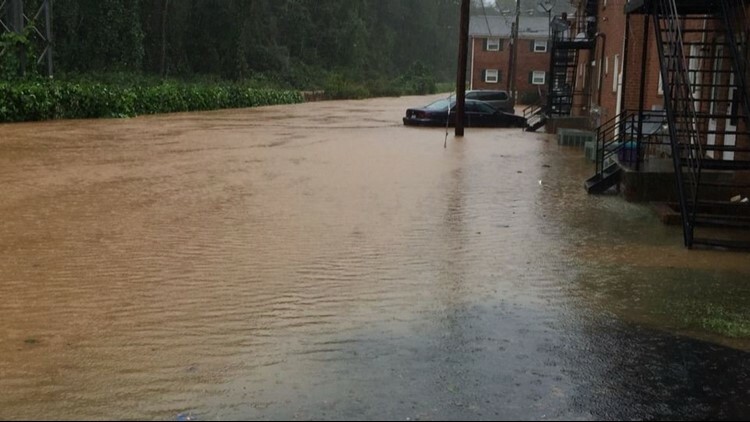 Flooding at Ladera Crest Apartments in Winston-Salem. 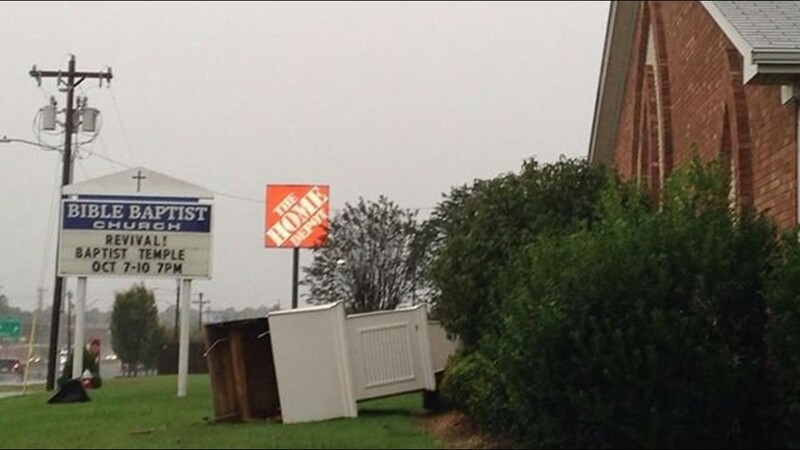 Damage in Greensboro. 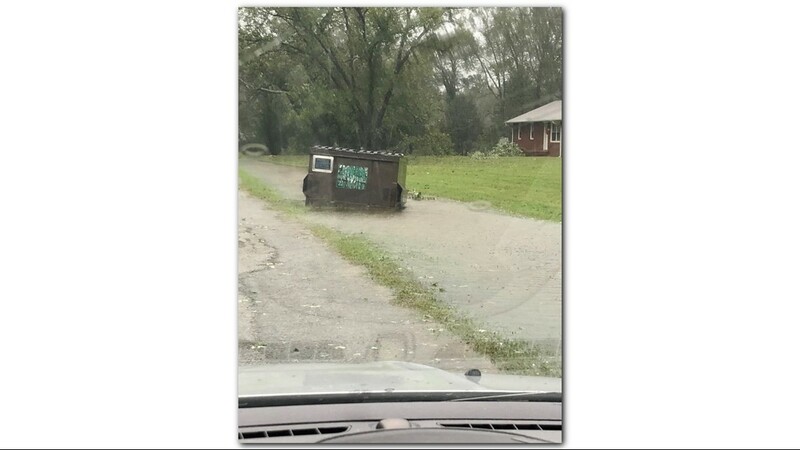 Photo from Ashley Benton. 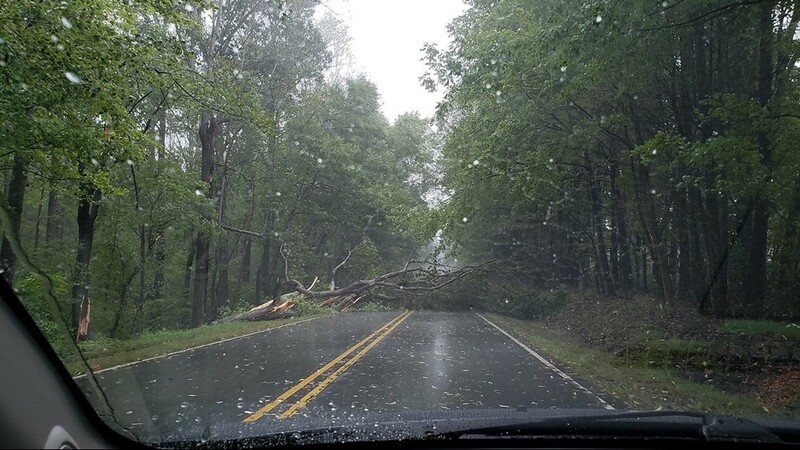 Tree down on Scalesville Road after Lake Brandt intersection in Greensboro. 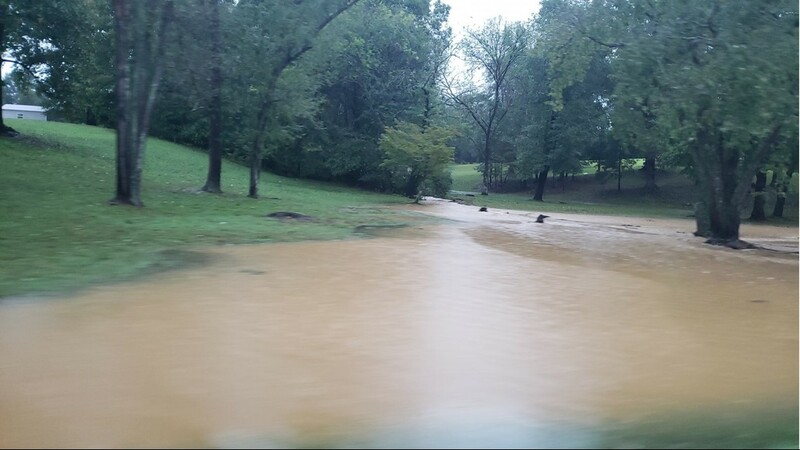 Flooding on Friendway Road at the Western Guilford High School entrance. 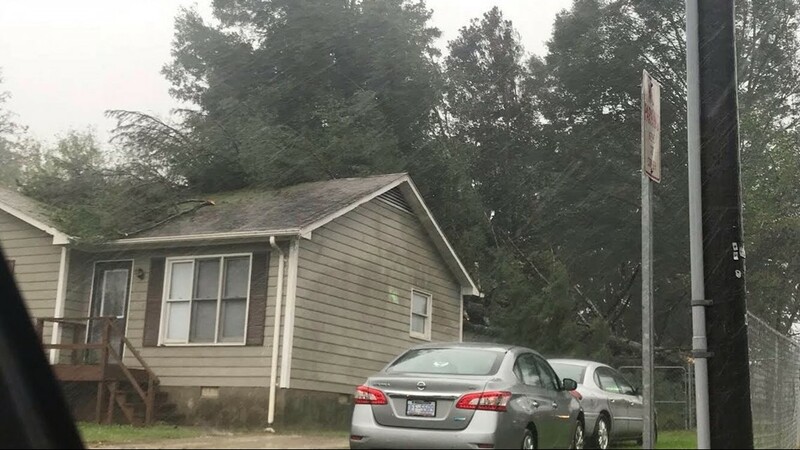 Trees down at a home in Lexington. 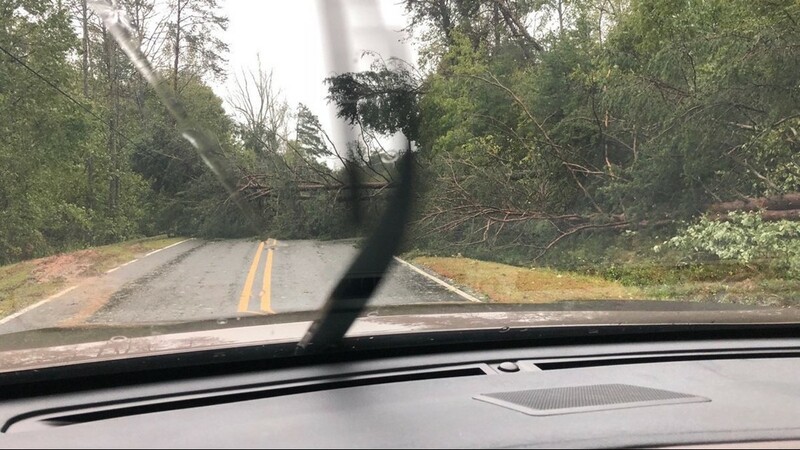 Tree down along Old Highway 52 in King. 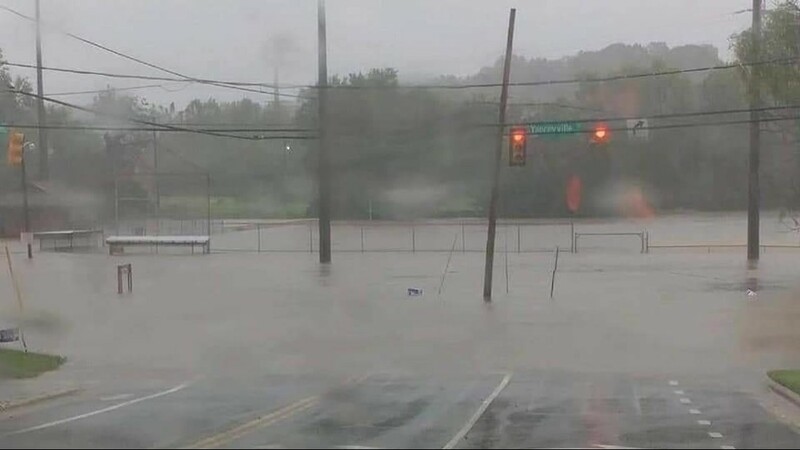 Flooding at Summit Ave. at Lindsay St bridge. 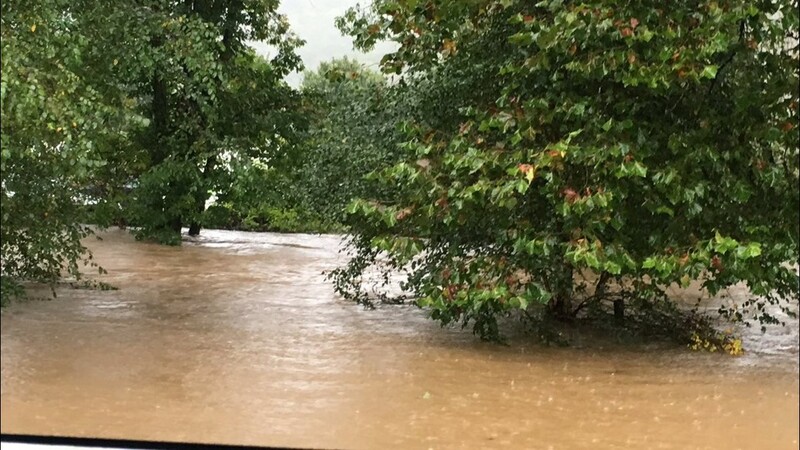 Valle Crucis starting to flood badly as the Watauga River crests. Photo from Wes Grimes on Twitter. 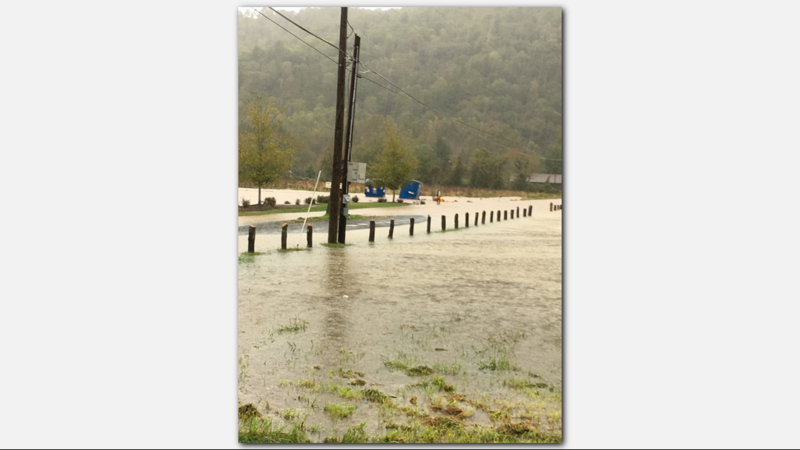 Flooding in Boone. Photo from Kristen Huddleston. North Carolina Governor Roy Cooper reminds everyone Michael is a dangerous Tropical Storm. 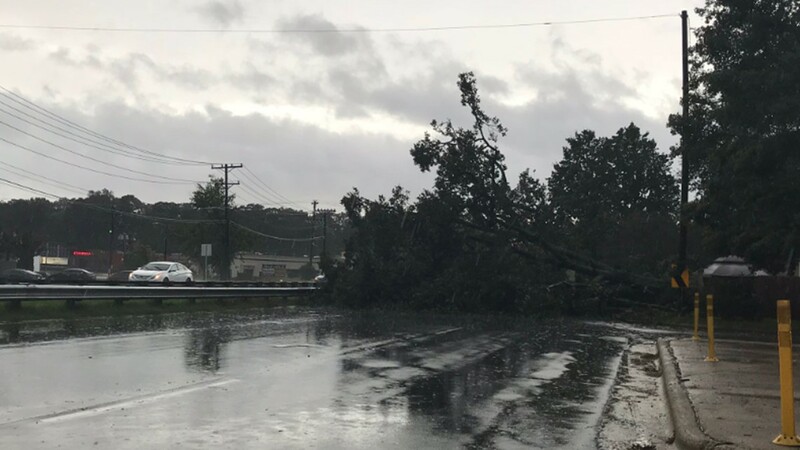 At least 16 roads have closed due to Michael. 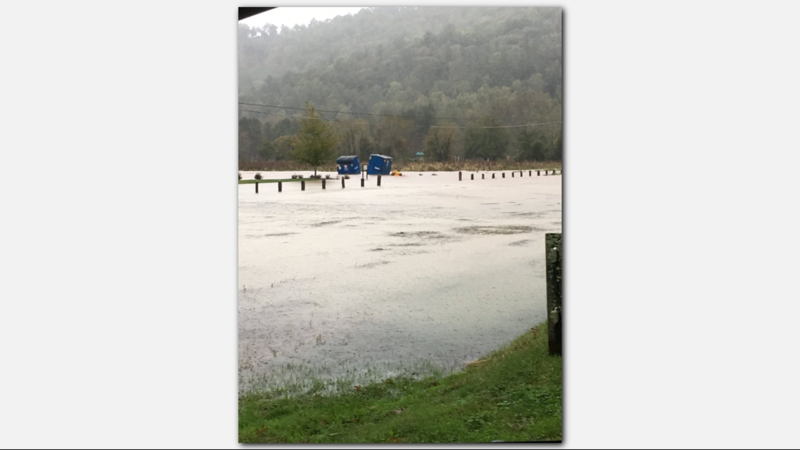 If you have to travel, leave space between cars and don't drive on flooded roads or past barricades, Gov. Cooper reported. Much of the state is on a flash flood watch and a tornado watch. 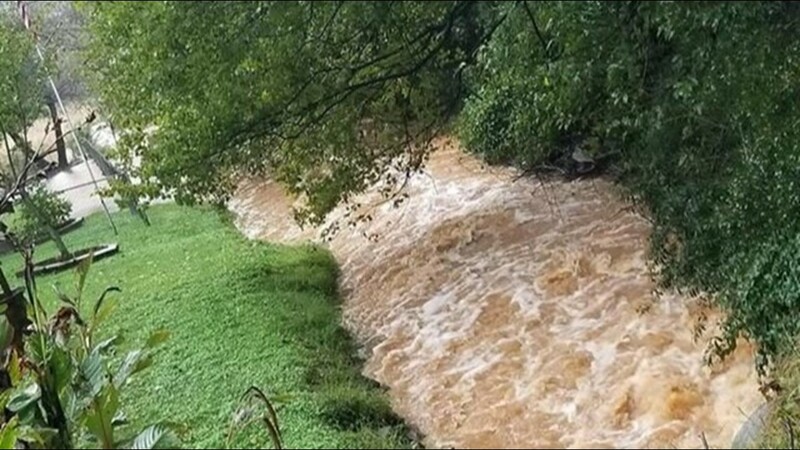 A few rivers are expected to flood. If you are asked to evacuate, don't question it, go. 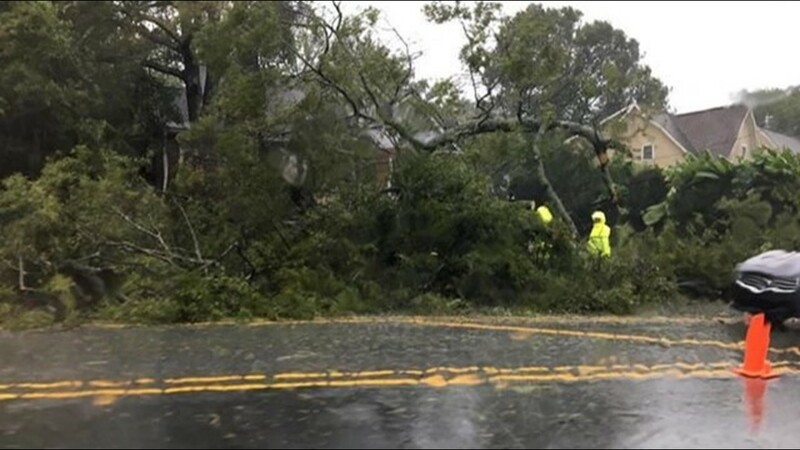 NCDOT Update: more than 2,100 personnel monitoring the storm. 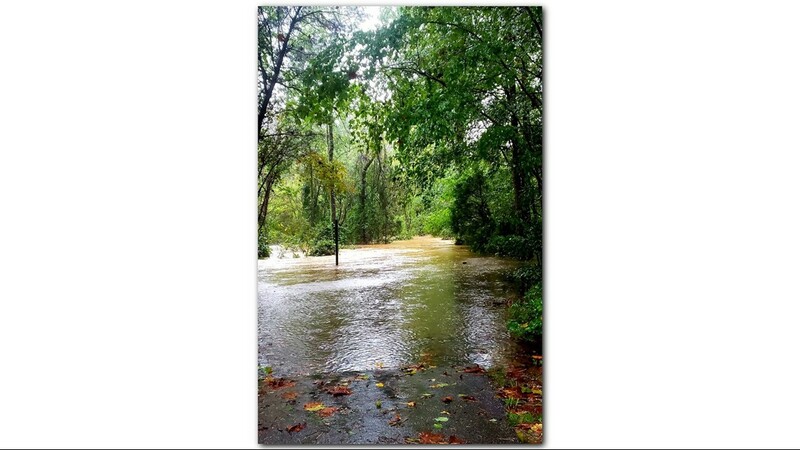 Will address any fallen trees on roads and will place closure signs where needed. Construction sites ongoing from Florence have been secured. 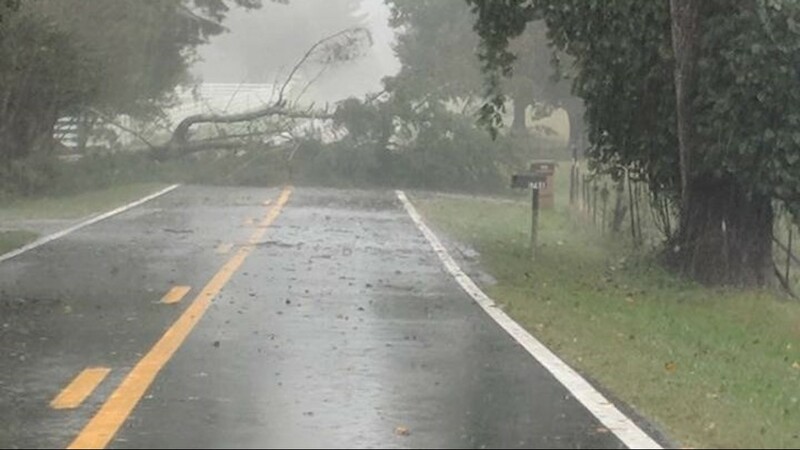 At least 16 roads have closed due to Michael. 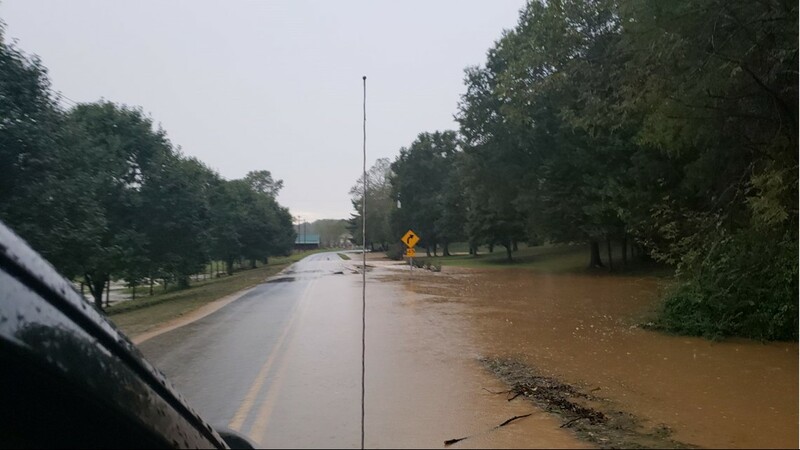 If you have to travel, leave space between cars and don't drive on flooded roads or past barricades. 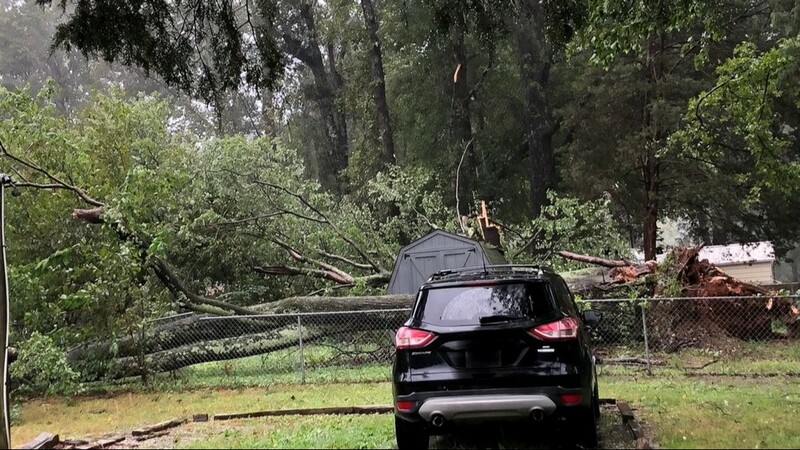 On Wednesday, Hurricane Michael invaded the Florida Panhandle bringing 155 MPH winds as a category 4 storm, the worst to ever hit the Panhandle. 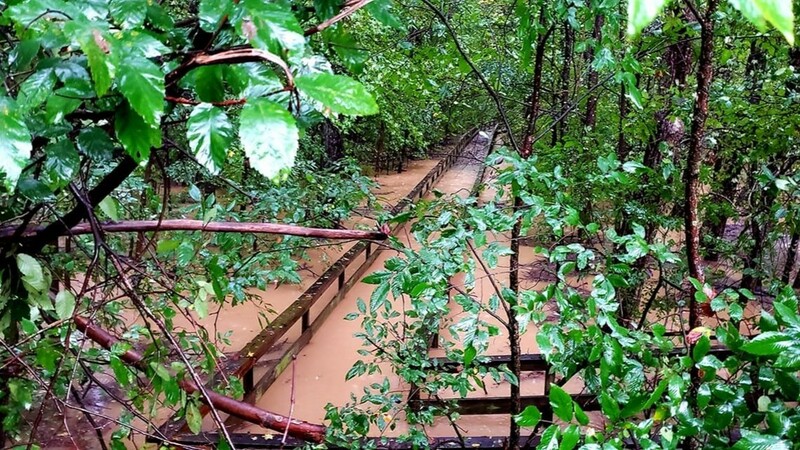 Its northeast track leaves North Carolina a target just weeks after Hurricane Florence ripped through the area. 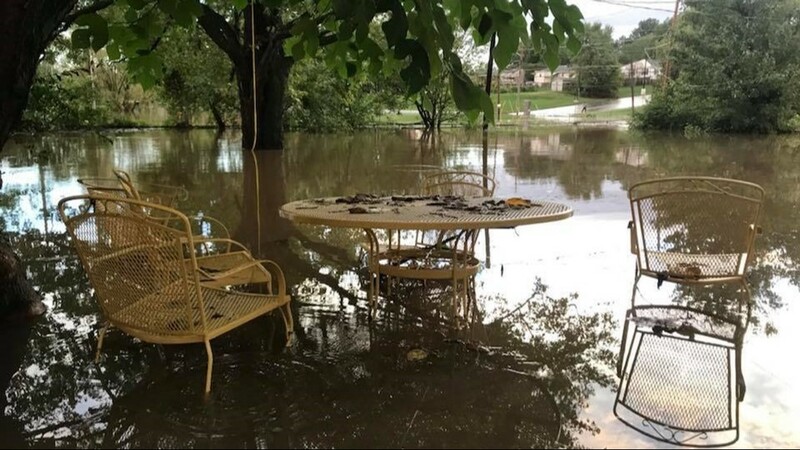 For us in the Triad, Michael projects to be a problematic tropical storm, with the biggest worries being flooding possibilities from the consistent rain we'll see for much of Thursday. 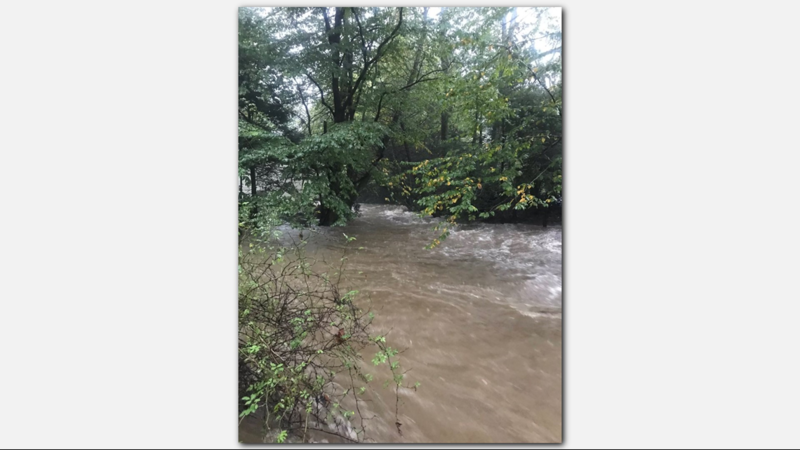 WFMY News 2 Chief Meteorologist Tim Buckley predicts the Triad will see heavy rain from midday until the evening hours. 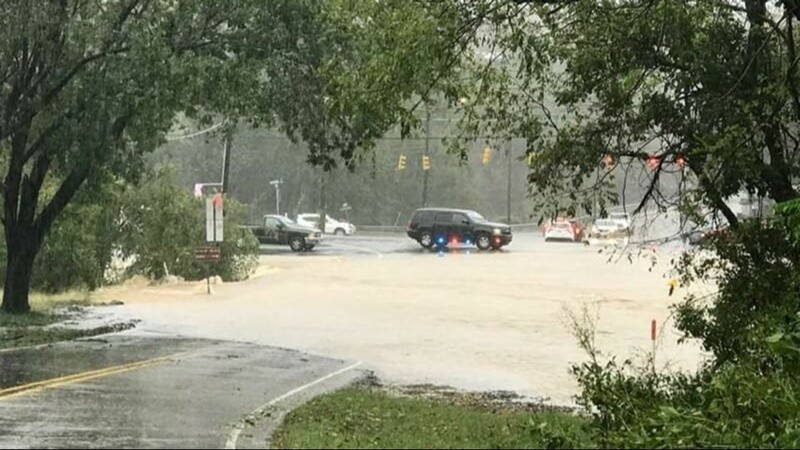 North Carolina Governor Roy Cooper declared a 'State of Emergency' on Wednesday while announcing he has activated the National Guard. Several counties in the state are already under a storm watch. As of Wednesday night, dozens of school systems announced closings for Thursday or plans to dismiss early. 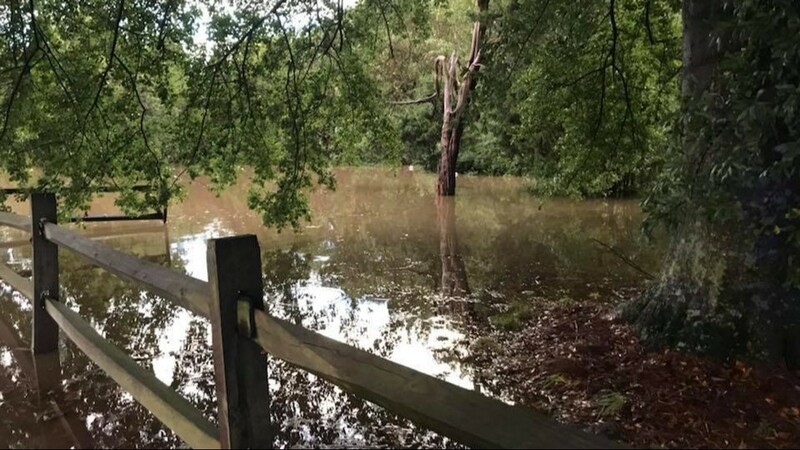 In the Triad, Guilford County Schools, Alamance-Burlington Schools, Randolph County Schools and Montgomery County Schools are all closed Thursday. Check out the full-list of closings below. 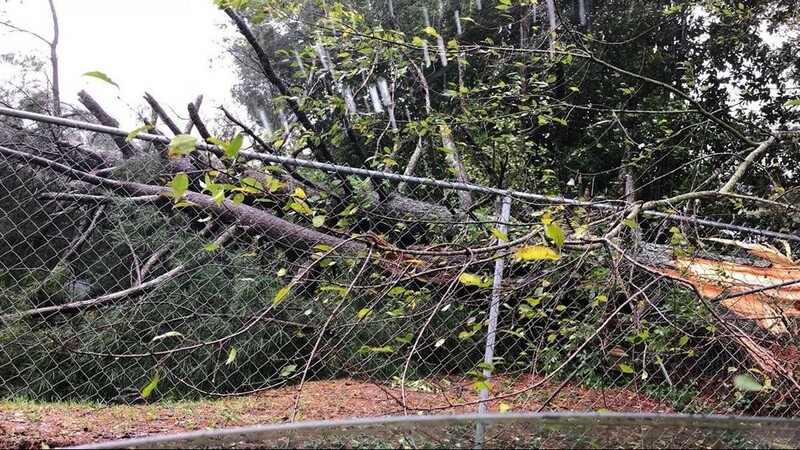 Duke Energy predicts between 300,000 and 500,000 power outages in the Carolinas. 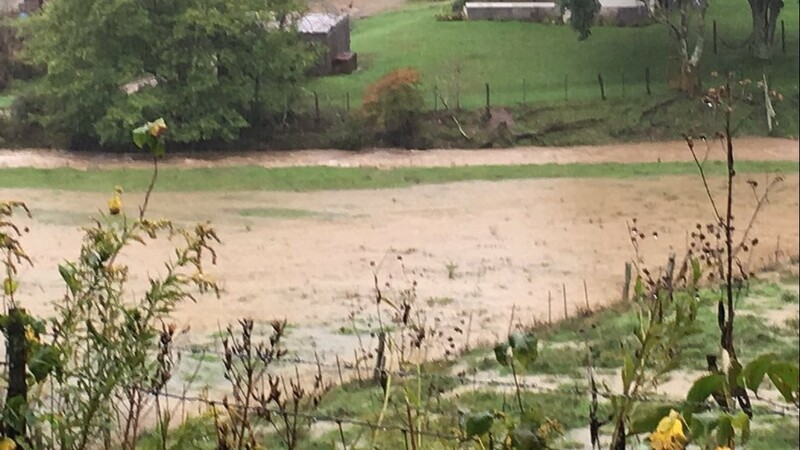 45 counties are under a tropical storm warning for high winds and heavy rain. 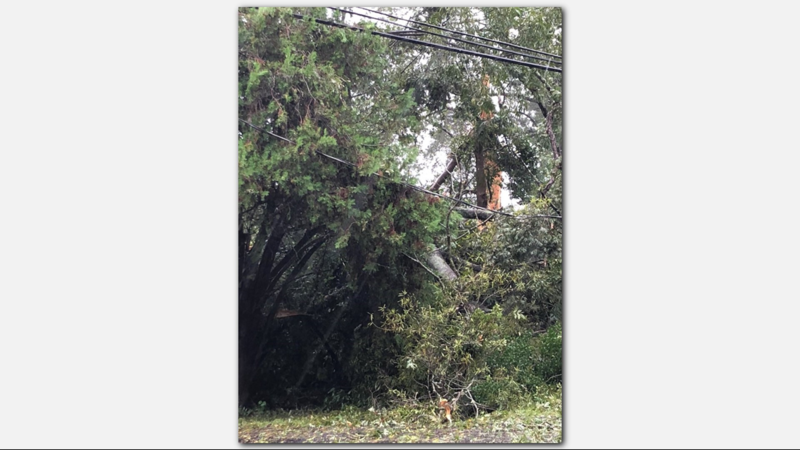 Safety Stay away from power lines that have fallen or are sagging during a storm. 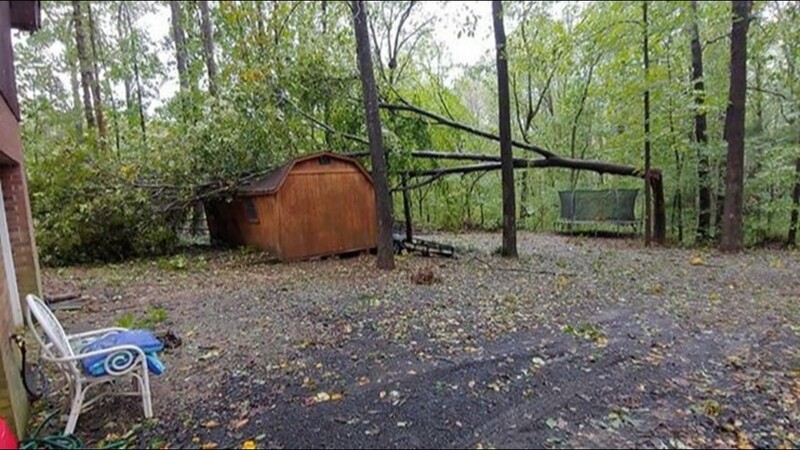 Consider all lines energized as well as trees or limbs in contact with lines. 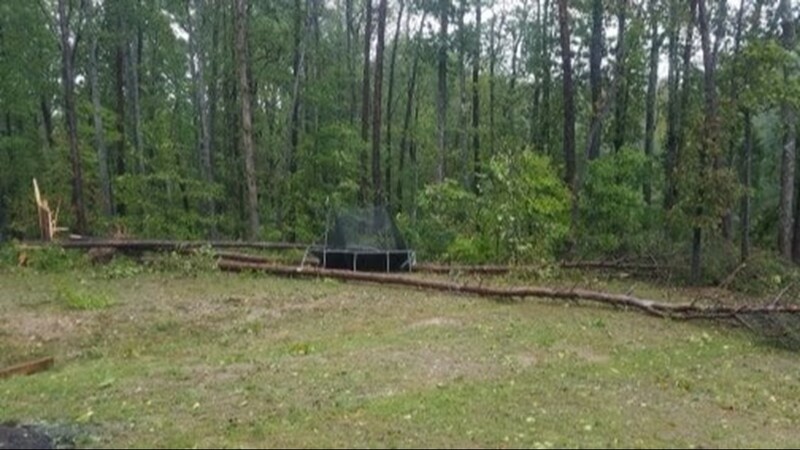 Report downed power lines to your local power company and to your police department. 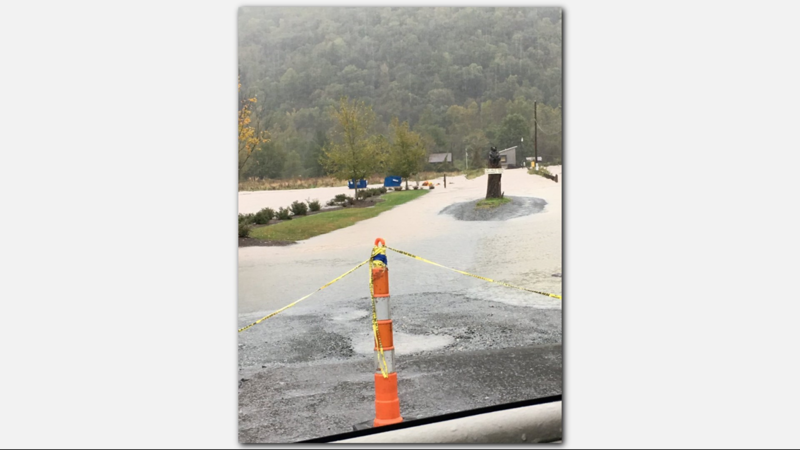 Flooding has already taken place on some roads in Alleghany County. 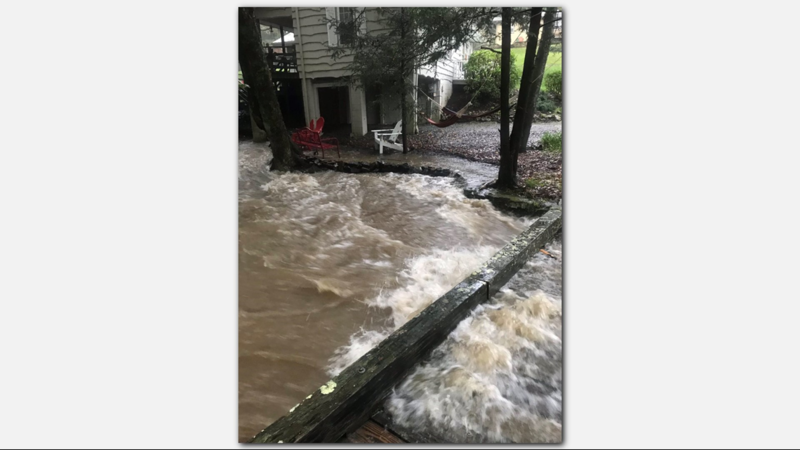 Check out these pics from social media from the Alleghany County Sheriff's Office Facebook page and William Bottomley on Twitter (@williebtv). 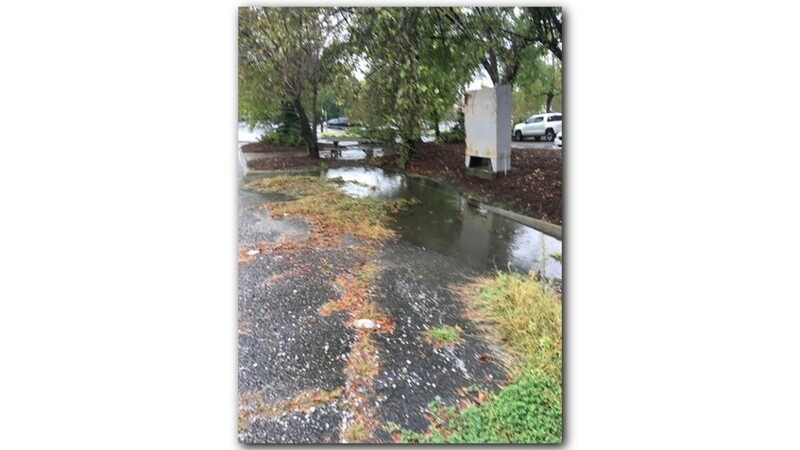 With a hurricane or tropical storm, there’s always a potential for flooding. 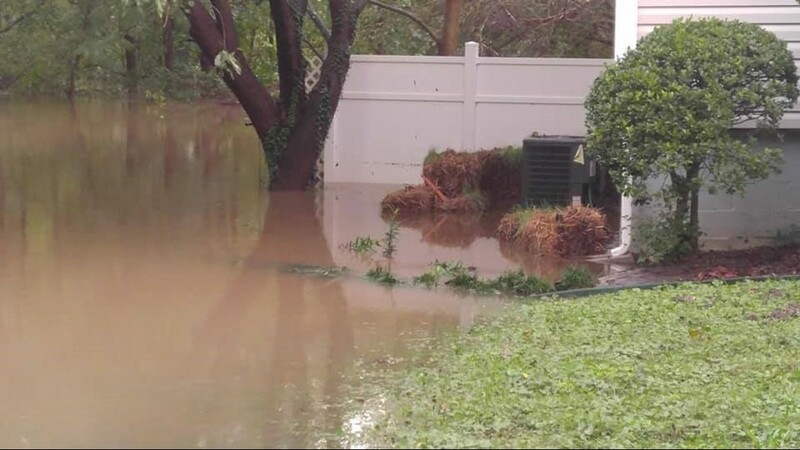 Here’s what you should know about flood safety. 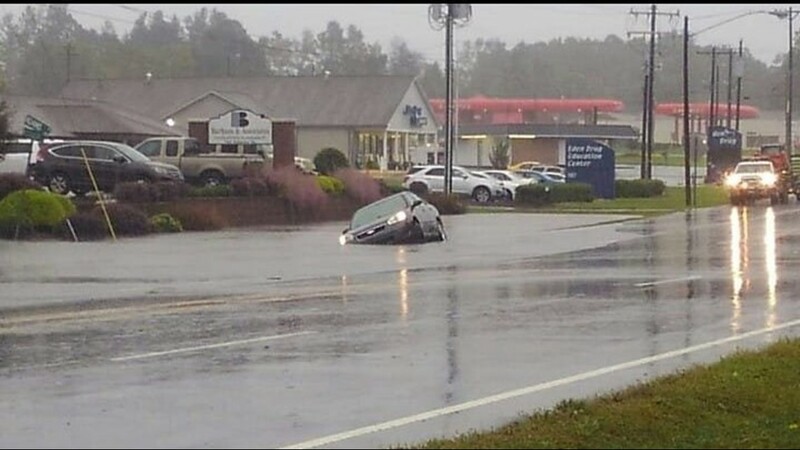 Remember to TURN AROUND, DON’T DROWN! 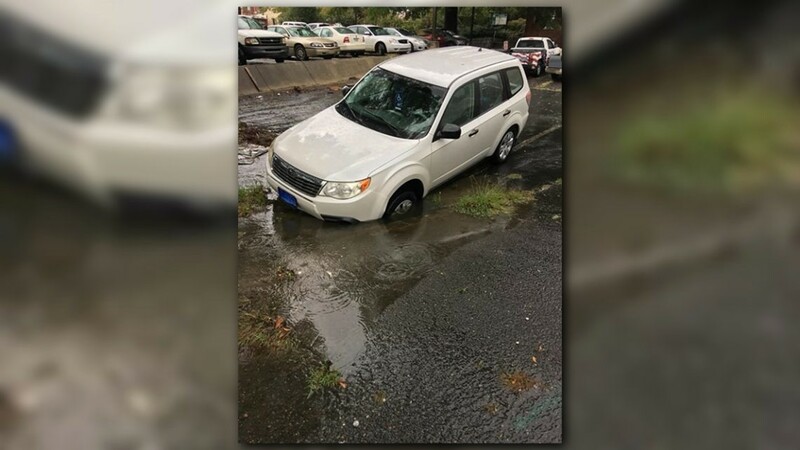 Avoid driving through pools of standing water.